As we prepare for this upcoming adventure, an early update is in order. Those of you who follow our cruises will know that we elected to defer our 45th Milestone reward until this cruise. 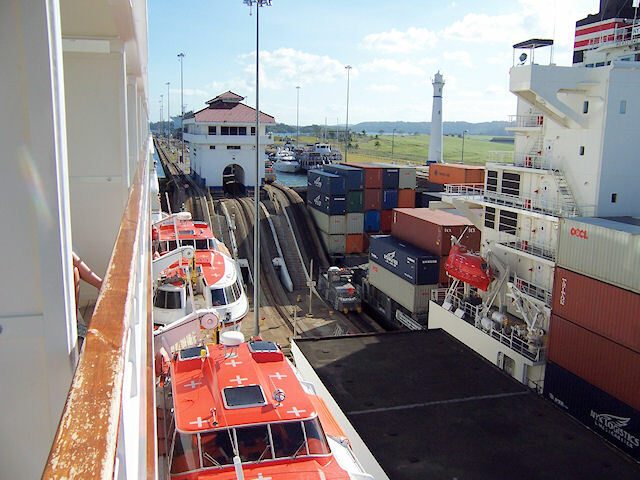 Basically, what that entails are two free private car transfers from the airport to the ship, among other things once onboard. That is intended to get you to the ship and back home again. When we decided to wait to use this amenity for this cruise, we spoke directly to the horse's mouth, so to speak, when we happened to meet the then-new head of Crystal Society, M.C. Wilkes. In our opinion, she is one of a few executives in the Los Angeles office who actually "gets it" (another being Thomas Mazloum). That said, she certainly does have her hands full trying to wake up some of her co-workers to the fact that they are working in a service industry. 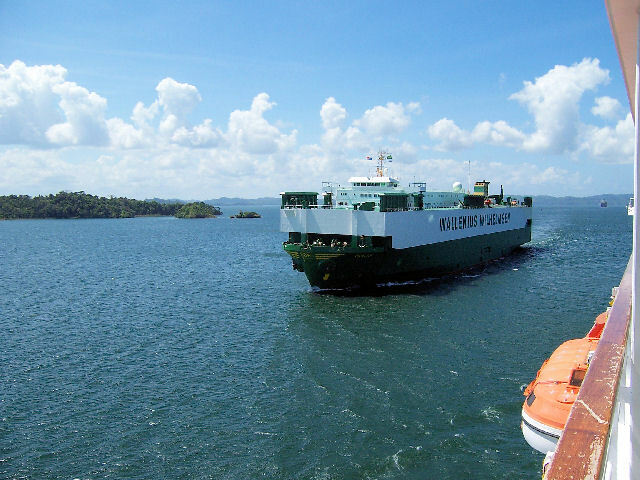 Thank goodness the ships aren't run in the same manner as the office! If you've had good luck in your dealings with the office, more power to you. We've encountered horrendous service and we're approaching the 50-cruise milestone. 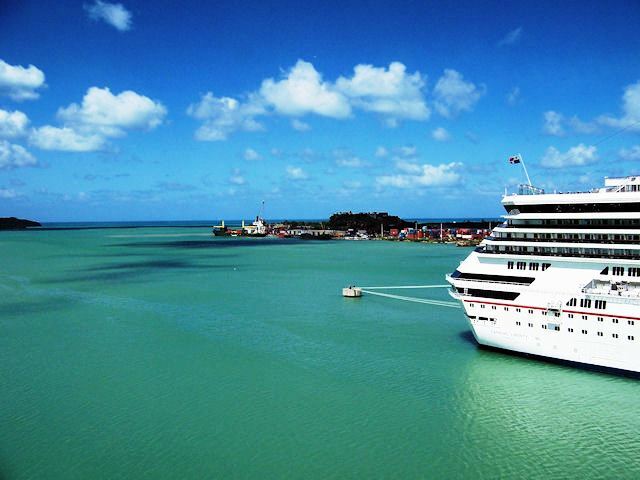 We can only imagine the response someone with two cruises gets (what response, perhaps?). We know how to get what we want, but what about guests who aren't as knowledgeable and/or pushy? So, here's the deal so far. We asked if we could use both of our transfers in Costa Rica. One to get from the airport to the hotel (which is not one of Crystal's hotels, by the way), and the other from the hotel to the ship. The limitation is that the transfers have to be within a 100 mile limit, which is not an issue here. The hotel is 70 miles from the airport and 15 miles from the port. The response right away was, "Of course, we can do that, no problem." That's the answer we should get and we did. However, the next step was to tell our travel agent to call Land Programs to make the arrangements. That would be easy enough except they never answer the phone or return messages. Hmmm, so you don't return calls to our travel agent, huh? We're on the phone to M.C. who by now probably rues the day she told us to call her directly and we're just getting started. So, we inform her that a certain person isn't returning calls and is generally making life difficult for our travel agent. No problem, she'll take care of it, which she does. Eventually, said missing person informs our travel agent that it is no problem to arrange this, but please call back in two months when it is closer to departure. Skip ahead to last week, which is two months since the first "no problem" call. Days of phone calls and voice messages ensue with no response from the same phantom person to whom our travel agent must speak to arrange transfers. Another call/email to M.C. prompts a fax from this person to our travel agent asking her to call, AGAIN. She does, voice mail. She calls again, out of the office. She calls again...you get the picture. Messages are left with no response. Eventually, she actually does manage to catch the Land Programs woman in her office. She probably wishes she had caller I.D. about now. Our travel agent goes through the song and dance she went through two months ago when it was "no problem". Land Programs woman says, "They are not on my list, call Crystal Society." Hmmm, could they get any more snotty? Talk about an attitude. We only wish she had treated one of us that way because we can assure you heads would be rolling. Oh well, by now our travel agent, who is no pushover herself, has called M.C. directly who prompts Land Programs to fax (although she said she would call) a form to fill out for our transfers. See, she said it was "no problem"! Now we'll wait and see what actually transpires between now and our arrival in Costa Rica. By the way, this is the condensed version of what actually happened. Really, it was much more complicated than this! The only person who did what she should do, and with a friendly, helpful attitude, was M.C. The thing is, if Crystal doesn't want to actually DO any of the things they promise in their rewards program, then don't offer it. If they do, then we expect it to be easy to redeem. We shouldn't have to jump through hoops to get what we deserve. On a more pleasant note, we had a chance to visit Crystal Symphony during a stop in San Diego. Our good friends Marco (shore excursion manager) and Benji (salon) invited us for lunch. Both of them have resigned and will have left the ship by the time you read this. After nine years of shipboard life, they have decided it is time to move on and start their life together ashore. We'll miss them, that's for sure. We plan to catch up with them during our stay in Costa Rica. Who knows, we may make it to South Africa someday! We had a pleasant conversation and lunch by the Neptune Pool. The deck guys were all asking when we are coming for real, but not to worry, it is coming right up! Today's travel saga actually began last night at 8:00pm when the car arrived to transport us to LAX. The drive normally takes about two hours, but since it was raining we expected the worst. It was no problem as it turned out, the drive took less than two hours even though it did pour rain about half the time. We arrived at the terminal at LAX at around 9:45pm for our 1:30am departure via LACSA flight 605. Just a tip if you are contemplating this same trip at some point, there is also a United code-share on this same flight. It costs roughly $200 more for the exact same seat, so book through the national carrier if you want to save some bucks like we did. No offense to Peruvians, but the scene in the terminal can best be described as a chaotic bus terminal in Peru during rush hour. People standing around everywhere with no clue what to do or where to go, luggage and boxes in piles, etc. We half expected someone to wander in with a few goats and chickens at any moment. Another word to the wise, if you are looking for the LACSA counter forget it. Everything is run by TACA, so that's where you go. The friendly woman at the podium at the end of the line looked at our papers (printed at home, we have e-tickets for this flight) and opened up the business class line for us. We waited at the front of the line for a while as the ticket agents dealt with the usual chaos of people not having a clue. By the way, we were two of maybe six Americans we saw the entire time in the airport lobby. This is just an observation, we're not complaining about it, but it helps to explain the air of hysteria that was taking place. When the ticket agent saw us standing there after about ten minutes, she flipped over a sign above the counter that made it business class only and began the check-in process. Although it took way longer than necessary it wasn't ridiculous. The glitch was due to us having three pieces of luggage that were overweight, but wanting the fee ($25 per bag) charged to a single credit card. Once that was handled by a supervisor it wasn't an issue. As you probably know, luggage isn't necessarily checked in at the ticket counter anymore. In the case of LAX Terminal 2, you have to go to the ticket counter with your luggage where it is tagged by the airline. Then you haul it back out into the lobby and turn it in to the TSA screeners with the big X-ray machine that's sitting in the lobby blocking traffic. That wouldn't be so terrible except there is no indication of where to form a line. Well, there is, but it says it is for Air France. Your tax dollars at work, but we digress. Once actually in the line, it moved relatively quickly (there were only ten people in it). The process involved handing the bags over to the TSA guy who puts them in a pile next to the machine until it starts working again. Once through the machine, a guy takes it back to the conveyer belt behind the same ticket counter where you were previously. Whew, that's done, now all we have to do is work our way through the crowd in the lobby to the next security checkpoint and up to the departure lounge. Luckily, there was no line at the guard who checks your paperwork to allow you onto the escalator. He was also relatively pleasant, which is more than we'd be under the circumstances. At the top of the escalator is the real security checkpoint for screening carry-on luggage and such. There were about six lines open and it should have been a fairly quick process. It would have been if the X-ray technician didn't have to call over a supervisor for every other thing that went though the machine. This is where you have to take off your shoes, empty your pockets and such. We knew what to do and had no problems in spite of Dave's carry-on being full of cables, extension cords, a camera and our menu scanner for the computer. Nothing was questioned and we even had an amusing conversation with the supervisor prompted by our eye rolling at someone giving her a hard time. A little sympathy for these people goes a long way sometimes. The departure lounges were a sea of tranquility compared to the lobby area. There are several brand name eateries and shops along the way and the lounges are relatively comfortable for an airport. We had nearly two and a half hours to await boarding, so we just sat there with everyone else who was half asleep or more. Boarding did commence about ten minutes early and wasn't any problem. Business class and some other people board first and the waiting passengers actually were polite and waited until they were called. We observed only four other Americans on this flight, which appeared to be full. Other than the fact that the flight and departure attendants looked to be 20 years old tops, there were no service issues. They were pleasant and did everything they were expected to do. After takeoff they asked if we wanted a snack consisting of a bowl of warm nuts and a small ham and cheese sandwich. It was adequate for a snack and we were hungry. It was impossible to sleep because the leather seats were hard as rocks and the leg room was poor for business class. We ended up watching the in-flight movie, Ratatouille, which killed an hour or so. After the movie they turned off the lights and expected everyone to sleep for a short while before breakfast was served. There was a choice between waffles and eggs, or so he said. Another attendant said it was pancakes. We chose the eggs that had some green peppers and onions mixed in. It came with tater tots (literally) and black beans on the side, also a carton of a tasty fruit yogurt, some fresh fruit and a roll. It was edible, but that's about all we can say for it. All in all, the flight was fine, not great, but fine. If the seats had been more comfortable we'd rate it higher, but that was lacking for business class. Otherwise, the service was good and the airplane was clean and in good condition. We'd fly LACSA again. By the way, the TACA logo was on everything, including the crew uniforms, so we have no idea why this was classified as a LACSA flight. Our arrival in San Jose was about fifteen minutes early (the total flight time was announced as 5.5 hours on board, which it was). The rain had no effect on the take off or the flight itself. A Crystal Cruises representative was holding up a Crystal sign when we arrived in the terminal and she pegged us as the guests she was waiting for before we even said anything. We didn't expect someone from Crystal to be waiting for us, so this was a nice surprise. She was extremely friendly, fetching a porter and guiding us through everything. Immigration took maybe 2 minutes if that. They had about ten stations open and there was no line at all. Even the immigration officer was pleasant. The airport in general was very nice. We were taken outside to our driver, who was holding up a sign for us outside the terminal. Taxis are readily available as soon as you step out of the terminal. This isn't the kind of place where vendors and taxi drivers grab at you, so no worries about anything like that here. Our driver introduced himself as Julio and took us to the adjacent parking garage to find his car. There was a bit of consternation over whether our luggage would fit in his car, but we managed. Most people aren't going off on a month of cruises, so the amount of luggage we have is a bit unusual even for us. 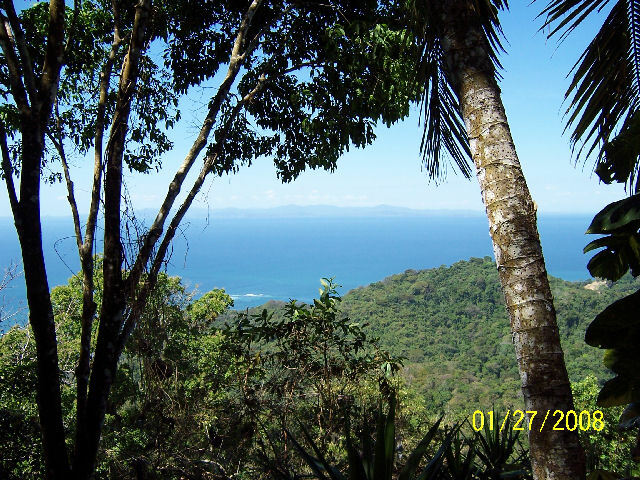 The drive to Villa Caletas, which is located on Punta Leona just north of Jaco, takes about two hours. The drive is on a winding road, but it is in very good shape and the scenery is attractive. Julio pointed out sights along the way and we enjoyed his company. The time flew by mostly because of the enjoyable conversation we had with him. Crystal uses TAM Tours for their ground services and excursions. 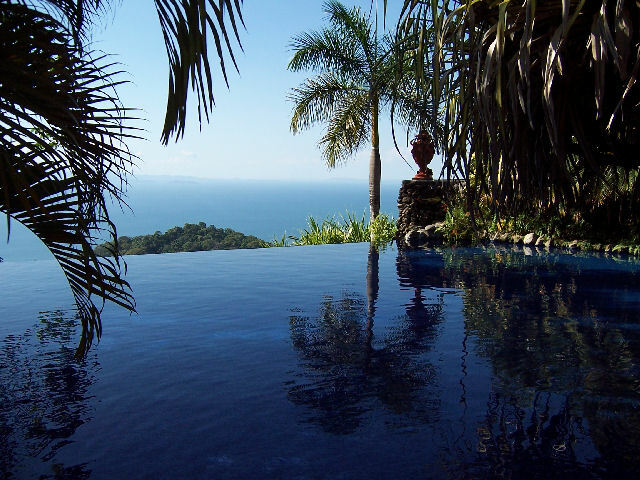 They were very professional and we'd recommend choosing this company if you are visiting Costa Rica on your own. There's no need to worry about driving in this part of the country. The roads are good and signs pointed to the major cities. Traffic wasn't an issue at all. 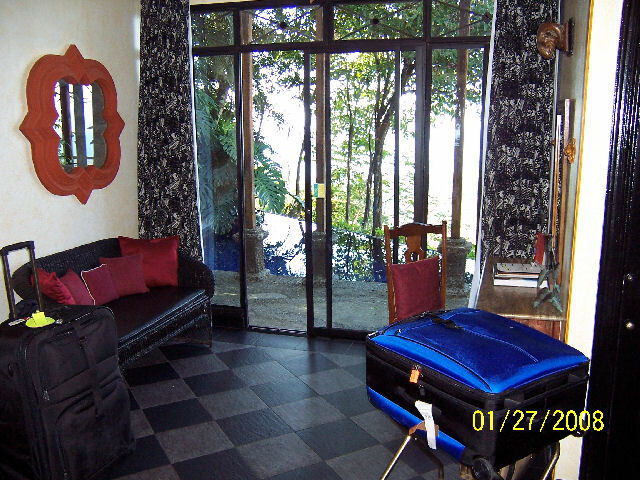 We arrived at the gates of Villa Caletas at around 10:45am, so we didn't expect our room to be ready. At the gate we were a bit unnerved when the guard couldn't find our name on his list, but that was straightened out before we reached the reception building because someone came out and called us by name. Well, sort of, but close enough. We were ushered into the reception lobby where they have two desks for check-in formalities. In the meantime, Julio unloaded our luggage and it was brought in for storage until our room was ready. We were checked in by Luis, who was friendly and informative, although we had no idea what he was talking about half the time. When we asked about the internet access in the rooms that is plainly advertised on the hotel's website, we were told we would have to upgrade to the Zephyr Palace rooms (for an additional $25 per night) to get that. We said we didn't care that much, we'd keep what we reserved. Because we keep up on the reviews via www.tripadvisor.com we already knew we wouldn't want to be in the Palace section. It is new and probably lives up to the luxury claim more than the regular part of the hotel, but we preferred to keep the private villa and pool rather than share it with six other couples. However, be aware if you book a room here of this gimmick to upgrade for an extra fee because it appears to be a regular occurrence. We were told that the room would be ready at around 2:00pm, which is the normal check-in time, and that we were welcome to start charging drinks and food to the room now. We took a walk around the hotel to take pictures of whatever seemed interesting. 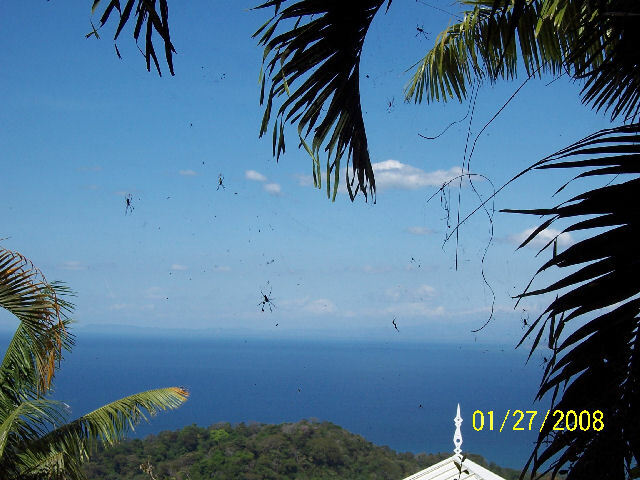 For anyone reading Tripadvisor you know that some people have an issue with huge spiders all over the place. What you don't know is that they aren't ON you, they are just in the jungle along the trails. We saw several maintenance men going around knocking the webs down, so it isn't as though they don't try. 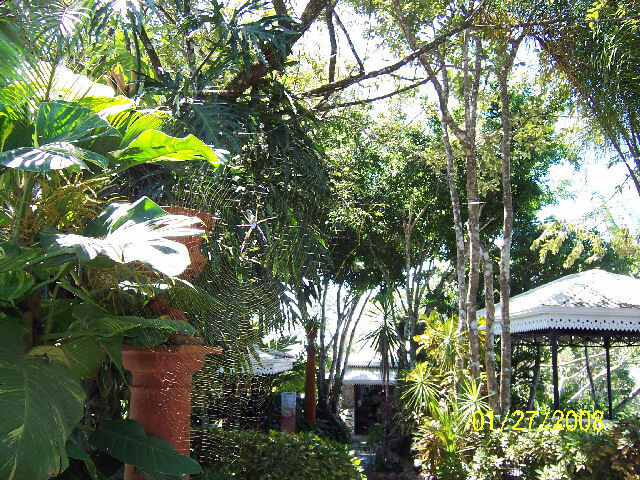 However, this hotel is in the rain forest, so what do you expect? The only thing they could possibly do about it is to douse the grounds with insecticide, but who wants that in such a pristine place? Let's be frank about this property, it is in no way shape or form as luxurious as they (and the price) lead you to believe. 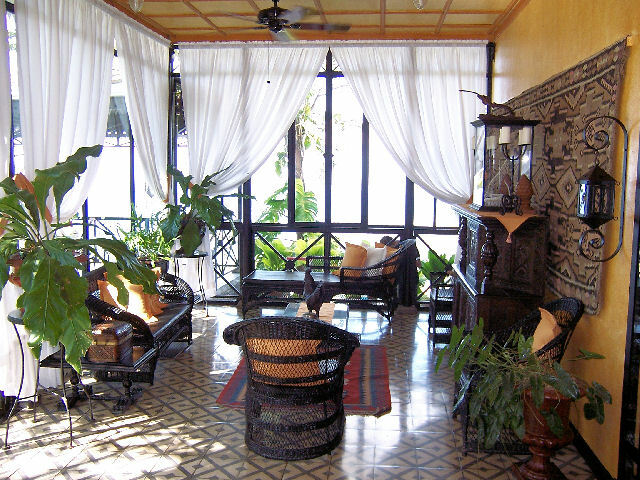 The atmosphere is decidedly casual and the amenities are a hodge-podge of high end and budget. 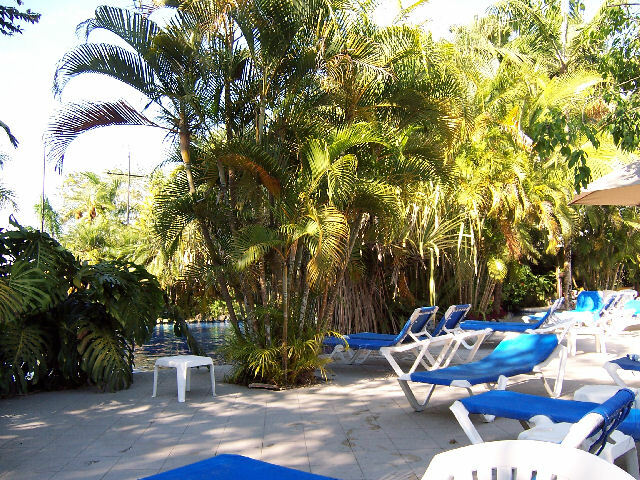 For example, there are cheap plastic chairs at the pool and the seating areas around the hotel are a bit disheveled. Not dirty, just in disarray as though nobody rearranges the chairs, ever. We're just reporting this, not complaining. The hotel is clean and the service is friendly, although it seems like the extremely young staff all started working here yesterday. We'd swear some of these guys are barely 16. There are a lot of them, no doubt about it, but every one of them seems to be doing their job with no training whatsoever. If the overall price was about half what it is, there wouldn't be any reason to complain, but at luxury prices the points should be sharper. It was very hot and humid today, so we weren't at all enthusiastic about doing anything besides surviving long enough to get to bed. While we were waiting for our room we had frozen drinks by the pool in a covered area that was furnished with very incongruous (ugly may better describe them) modern sofas under a Victorian awning. Again, the service was adequate and we got what we asked for, except the waiter didn't ask if we wanted another when we were finished. 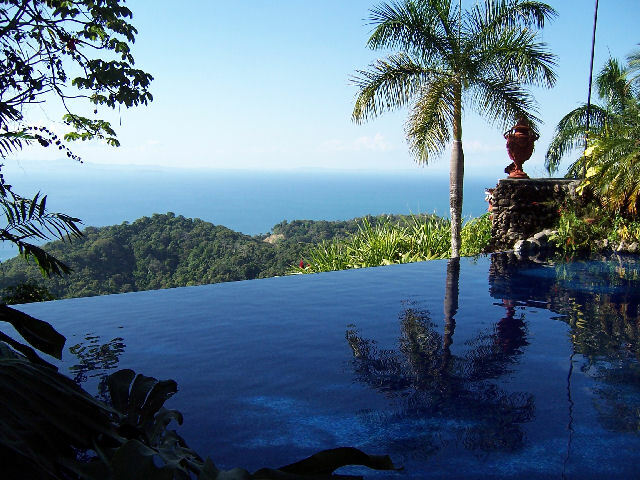 The pool area is very attractive, as is the large infinity pool (which is not heated, by the way). 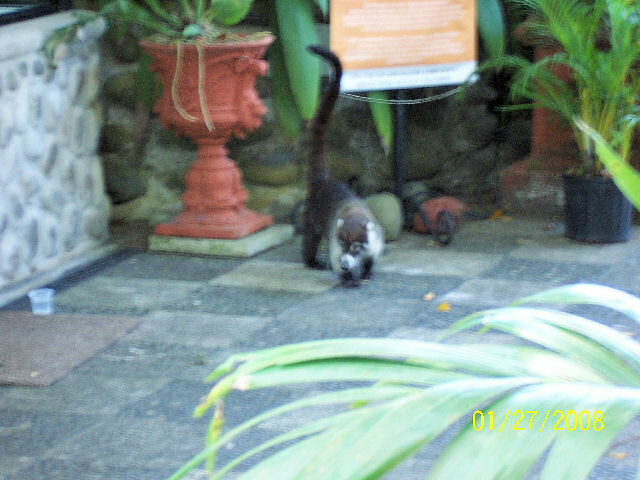 We saw a very tame anteater sort of creature outside of one of the spa cabanas. We're not sure if it is a pet or wild because one of the spa girls spoke to it on the way past and the animal looked at her endearingly. They had left a cup of water out for it. We saw it eating the huge ants off the sidewalk while we were there. Hmmmm, can we get one of those things to eat our ants? Poor thing would probably explode from overeating. Eventually we were having problems staying awake, so we went for lunch in the Amphitheatre casual restaurant. We figured it would kill the hour we had remaining. No problem with killing an hour because the service is so relaxed that it took almost two hours for the meal. We both had entrees rather than sandwiches because we knew we wouldn't last until dinnertime. Also, we were told at reception that reservations are necessary for the restaurants at night even if you are a hotel guest. 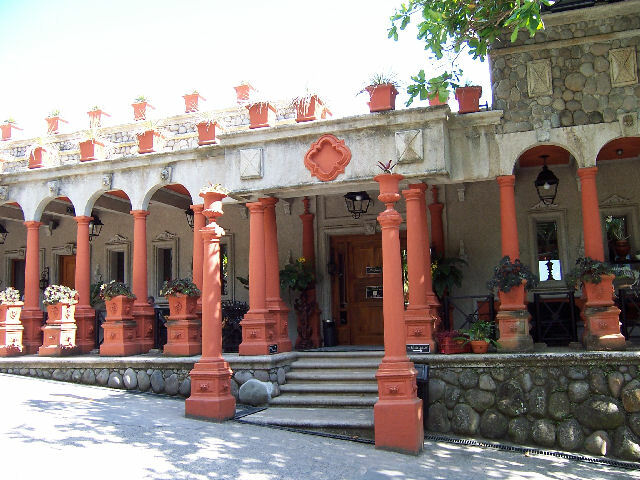 We can see that for the fancier Mirador restaurant, but we find that odd for a casual eatery in a hotel with only 45 rooms. Anyway, back to the subject of lunch. 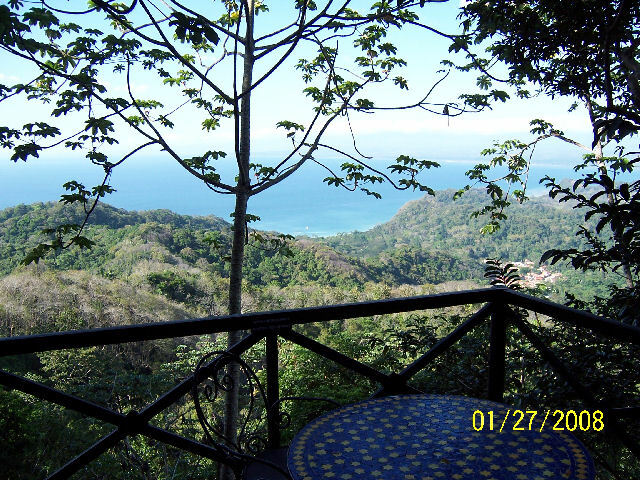 The restaurant's outdoor terrace affords a spectacular view down the steep hills to the ocean below the hotel. Tourists came in droves just to gasp at the view, but we thought that was a bit over the top. The view is nice, no doubt about it, but unless you are from Kansas in the middle of winter it isn't awe inspiring. 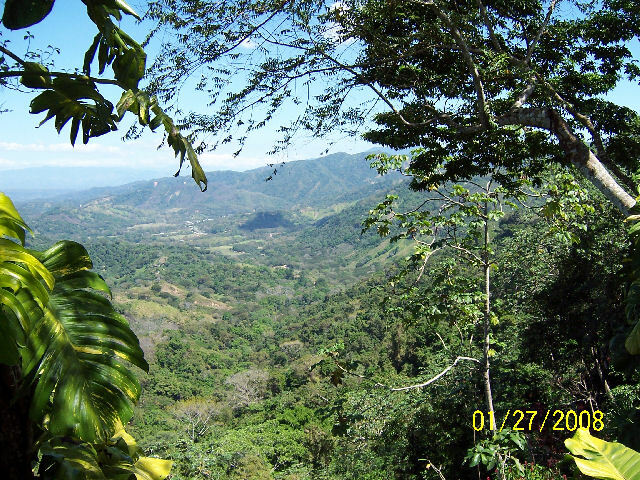 There are views like this all over Costa Rica, in fact, we saw a stunning valley on the drive to the hotel that was well worth looking at. We had one entree salad, a Caesar with baby shrimp, Chicken Satay skewers, and Coconut Fried Shrimp. We thought all of the food was above average to very good, but it was in no way shape or form worth the prices charged even for a high-end hotel. We also had two fruit smoothies and a large bottle of water, and one cheesecake dessert. The total bill was $84 including service charge. Again speaking of the service, it is friendly and plentiful, but very haphazard. None of this is a big deal to us, but some people would really be put off by it, especially at these prices. Everyone speaks English at an acceptable level. By the time we wandered back to reception it was after 2:30pm and the regular check-in people were gone. The man who helped us check in was nice, but didn't seem to know what to do. It took a while to find out whether the room was ready (it was), where our luggage was (in the store room), and how to give us keys. Apparently the Master Suites don't have electronic locks, so we were given a key ring with four regular keys on it. After wandering around the hotel grounds earlier, we were happy to find that our room is just a few steps away with no stairs on the walkway to get to it. 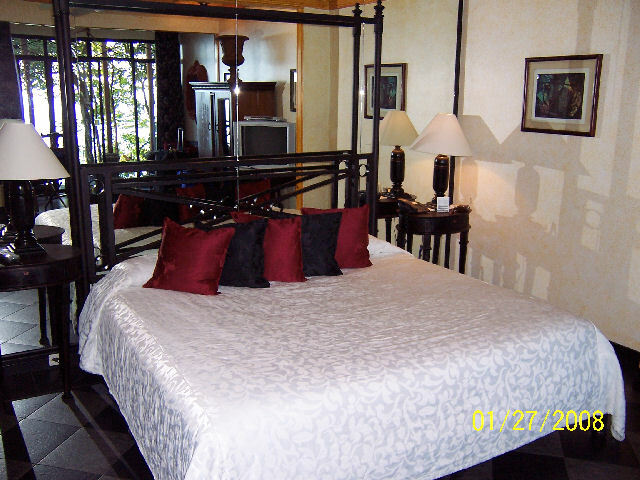 The Master Suites are the largest accommodations here and have a private plunge pool. 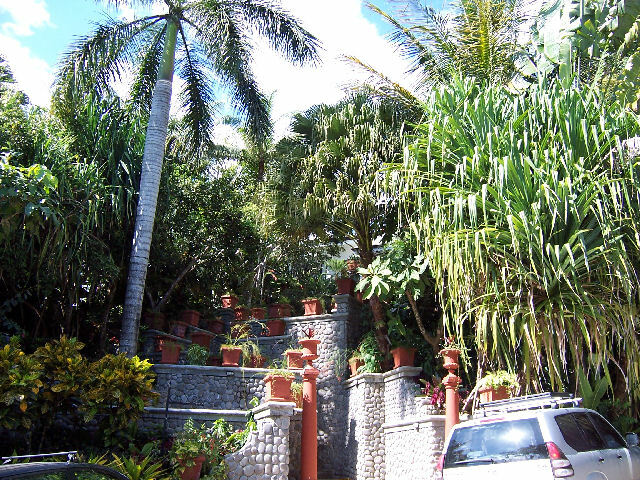 Some of the other villas are up and down a lot of stairs. 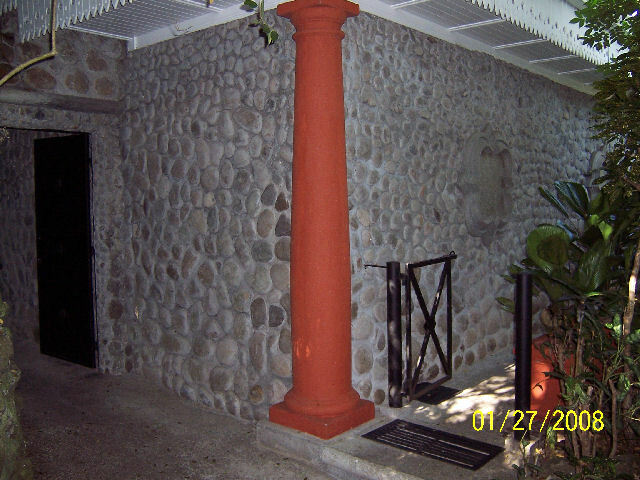 We were assigned to villa 19 which is at the end of a short walkway near the reception building. 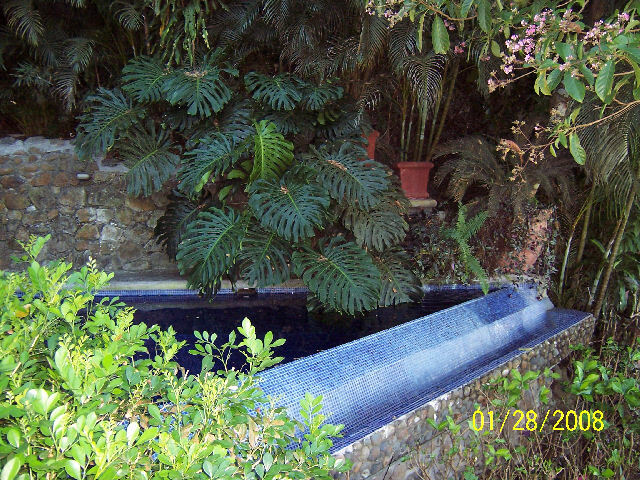 There is an iron gate that is locked, leading to a private courtyard, through another locked gate, and onto the patio with the small infinity pool and waterfall. 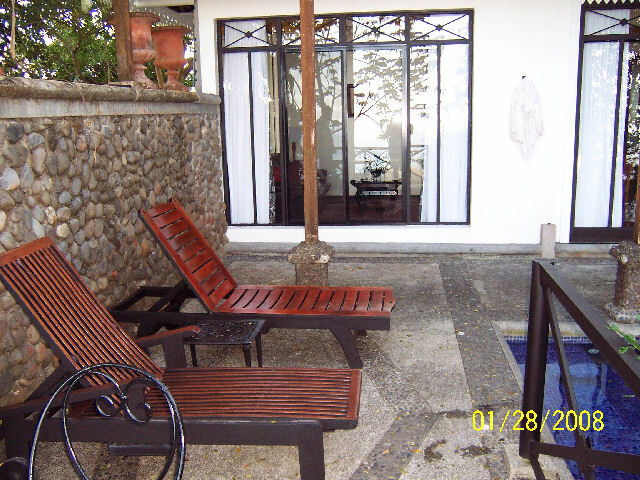 Access to the room is through sliding glass doors, which are the only windows in the room besides the bathroom. The pool was full of leaves, but only because they are continuously falling from the trees, not due to lack of attention by maintenance. As mentioned before, our key ring held four keys. One is for the gates, one for the safe, a small one that opens the sliding door AND the mini bar, and one that went to none of the locks we found. 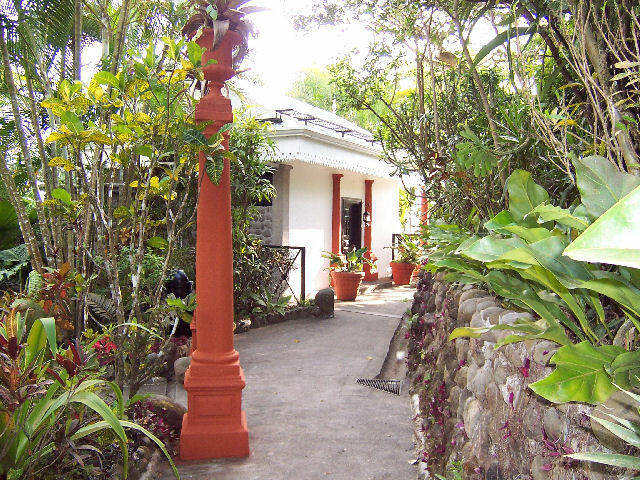 Probably the best way to describe these accommodations is to say that they are like staying at someone's grandmother's house if said grandmother happens to be a French Colonial Costa Rican Gothic Victorian. They are, to say the least, eclectic. They have everything necessary, especially central air conditioning that works. 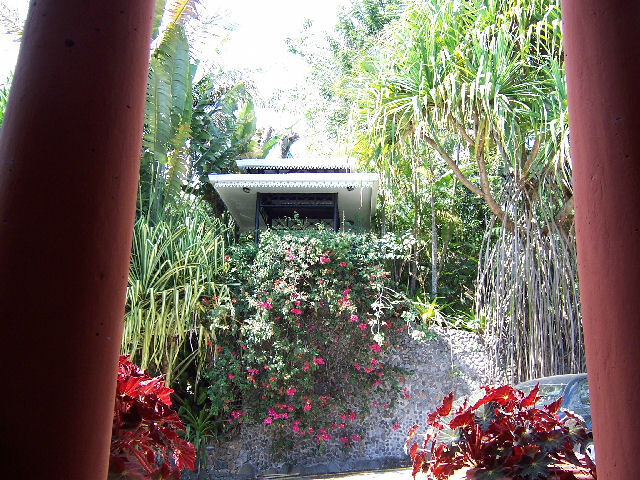 Most of the rooms here are in detached villas surrounded by jungle, so you get the impression you are staying in a private cottage all by yourself. Come to think of it, you are. You can't see or hear anyone else from your room. Our room is large, but not outrageous. 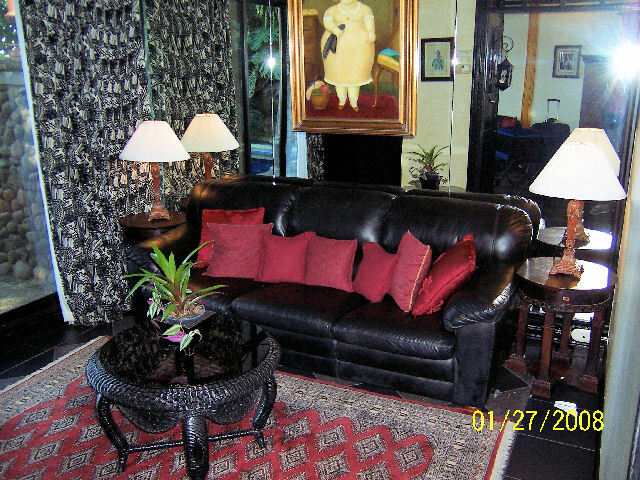 There is a separate sitting room with a leather sofa and black wicker coffee table. Sliding glass doors look onto the pool terrace and the ocean below from both rooms. The bedroom, which is where you enter through the sliding doors, has an armoire for clothing, a small desk, a very uncomfortable wicker sofa, and a king sized bed in an alcove. There is also a table with a coffee maker and a closet with a mini-bar. The bathroom looks very institutional with all while tile walls and very slippery slate floors. The bath fixtures are very cheap, more akin to a Motel 6 than a luxury hotel, but they work properly. The sink counter is made of exposed aggregate concrete which is impossible to clean and always wet, so that may creep out some neat freaks, which we most definitely are not. However, we'd be reluctant to lay a toothbrush on it. The bathroom amenities are not of high enough quality for the price, but they are there. Plenty of white towels are available, but there are no hooks or towel bars on which to hang them. 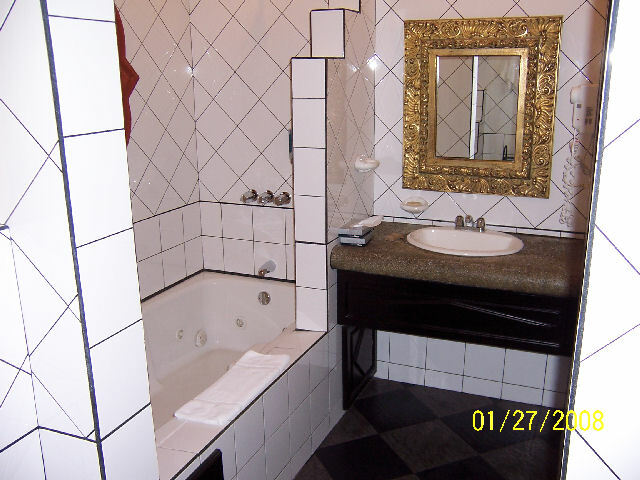 There is also a Jacuzzi tub and a large tiled shower. The soap, conditioner, and shampoo for these is dispensed from push-button things on the wall, which would be fine except none are labeled. Oh well, if we wash with shampoo at least we'll be nice and shiny. There are some maintenance issues with the room, none of which we'll bother mentioning until we check out, just so they can address them if they want to. The lights in the little entry area don't work, the bathroom fan doesn't work, and the blanket on the bed is a bit dirty. We didn't use it, but we wouldn't want to touch it necessarily. The sheets are clean though. Overall the room smells a bit of mildew, although none is visible. Like we said, it's like staying in an old private house. However, your grandmother probably doesn't charge you $425 a night. On the other hand, if you had a room like this in the U.S. or Europe with the private pool, you'd surely pay three times that. By 3:00pm we were simply not able to stay awake any longer. So, after braving the weird bathroom and taking a shower, we promptly crashed. We had no comfort issues with the bed that so many have complained about on Tripadvisor, but it isn't plush by any means. We did not find it uncomfortable either, so to each his own. We woke up only briefly when our friends called to talk about meeting up later in the week. We immediately went back to sleep and didn't wake up until 9:30am the next day. By the way, although the private pool looks nice and seems like a good idea, it isn't heated at all. Since it is in the shade all day, it is freezing. It may be room temperature at best, but since the air temperature and humidity is so high it feels almost sub-zero. The patio is quite nice though, with a table and three chairs, plus a pair of mismatched wooden loungers and a hammock that can be strung up. We judge the condition of the exterior to be somewhat rundown and the landscaping needs some attention, but it isn't terrible. We have seen men doing touch-up painting, so it is probably a never ending battle to keep it looking as good as it does. 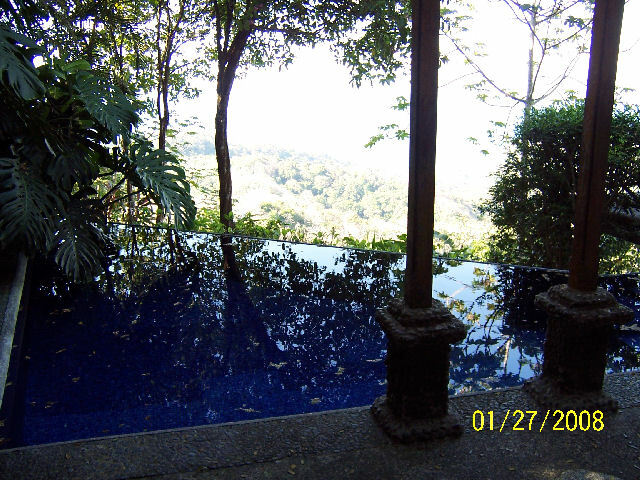 The patio overlooks a very steep jungle hillside that tumbles down to the ocean. As mentioned yesterday, we didn't even begin to think about waking up until 9:30am this morning. It was extremely windy overnight, but we only heard it when we happened to wake up for a few minutes. Eighteen hours of sleep was enough to overcome the lack of sleep yesterday, so we are refreshed today and ready to go. Well, ready to go to breakfast anyway. We wandered up to the Amphitheater restaurant at around 10:00am and were the only guests in the place most of the time. One other couple arrived after us in a frantic rush to get out of there. We think they were trying to be nice and get out by the end of the breakfast hours at 11:00am, but the restaurant is open all day, so there was no need for it. The service was the same as yesterday, friendly, but unpolished. We had waffles and pancakes topped with fresh fruit, a fruit plate and two smoothies. We don't recall the price exactly, but we believe it was about $25 before tip, which was reasonable for what we got. The food was very good and we were happy with everything. Our table was adjacent to the famous amphitheater where you are supposed to gather for the sunset. The amphitheater looks like an accident waiting to happen to us. There is no way you could have a facility like this in the U.S. or you'd be sued out of business. It is steeper than a 45-degree angle down the hill with hardly any railings to hold onto. If our waiter had taken a step backward he'd have tumbled down the steps, tray in hand. Apparently the day trippers start to arrive about lunchtime. Several of them arrived to take photos from the top of the amphitheater which isn't a big deal unless you are sitting there eating. There is also an outdoor bar you walk through to get to the restaurant, which seems nice for a sunset drink. After breakfast we stopped by the concierge to ask about using the internet to check email. She directed us to a laptop sitting on a nearby coffee table. While it worked it really isn't adequate for a high-end property like this. We also inquired about dinner reservations and were told the the Mirador Restaurant is closed tonight, so the only option is the casual restaurant, which also needs reservations. We were given a choice of 6 or 8:00pm, we chose 6:00. The concierge women were giggly and friendly, but the lackadaisical trend continued. Back at the room there was a guy servicing our pool. Well, his equipment was there anyway. Eventually he appeared and was friendly, waving to us through the window. He fished the leaves out of the pool twice and cleaned up the patio furniture. All that is a losing proposition because the leaves rain down with the slightest breeze. After he left, some beautiful yellow birds arrived in the trees and began dive-bombing into the pool. There are other birds around, but we haven't seen any close enough to describe them yet. Rather than wait and forget everything that has happened the past couple days, we stayed in and updated this diary and processed the pictures we took yesterday. Someone came by to replenish the mini-bar, but no maid service so far after 2:00pm even with the sign outside. We saw "Please clean the room" signs on doors after 5:00pm yesterday. By the way, we'd sure hate to be a maid around here. 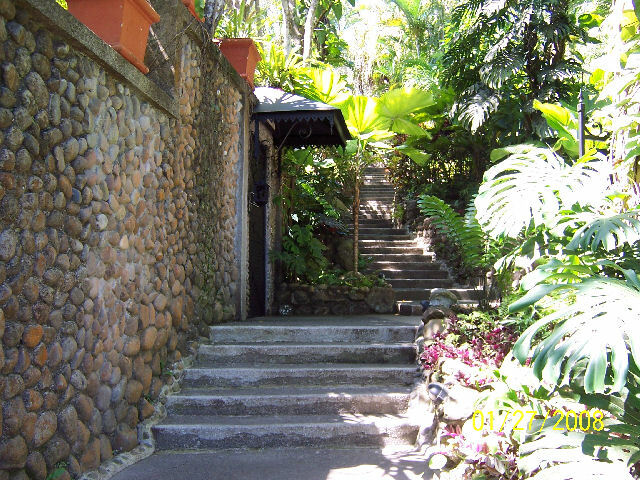 Our room location isn't bad, but there are literally hundreds of steep steps down to most of the villas and suites. There may be service trails or something, but we didn't see any during our explorations yesterday. We wandered off for lunch around 3:00pm even though we have dinner reservations for 6:00pm. As with breakfast, we were the only customers in the restaurant. Our waiter was very friendly and the service was fine. It occurred to us that being here on a busy weekend compared to the slower weekdays probably plays a big part in the overall impression one gets of this hotel. Although the pool area was full, there aren't many lounges to begin with, so almost any amount of guests there and it would look busy. 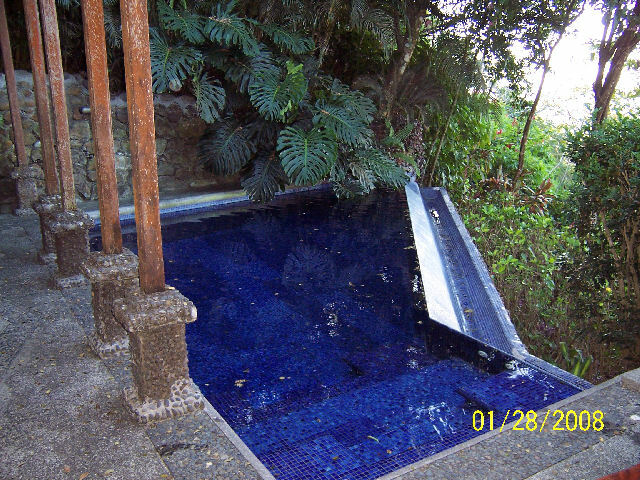 The pool itself is an adequate size for the property. The only issue with lunch was that we didn't get one of the items we ordered, but we weren't charged for it, so no big loss. We're in no danger of starving to death. The Sea Bass entree was offered cooked on a grill at the table or from the kitchen. We chose the kitchen because the grill consists of nothing more than an electric griddle that is dragged over to your table. We saw no point in making a show of it. The version from the kitchen was very good. The other meal was an Italian Panini sandwich that was good, but nothing special. It came with a tossed salad. The total bill for those two items was about $42.00, but the fish was definitely something we would consider a "fancy" meal and the portion was generous. We chatted with the waiter and found out that the menus are new, so they are always asking how the food is. That may be the reason we find the food better than expected based on the reviews we have read. The selection is eclectic for sure, but still a bit limited for a stay longer than a few days. There is something for everyone though. Our waiter also said that it gets very busy around sunset when people arrive who are not hotel guests. The staff has to constantly prevent them from overtaking the restaurant terrace. The reason for the requirement of dinner reservations is that they save all of the terrace tables for hotel guests first. Non-guests are seated indoors. 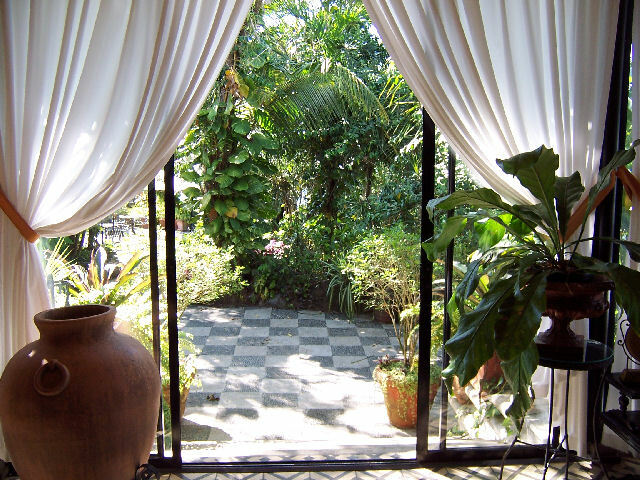 We really wouldn't mind sitting inside as long as it is air conditioned, so it wouldn't be a big deal to us. We asked to change our reservation for 8:00pm tonight when we might actually be hungry again. After lunch we wandered around a bit, then went back to the room and sat on our terrace by the pool for a few hours. The same type of animal we saw yesterday outside the spa was wandering along the top of the retaining wall along the pool for a few minutes. Otherwise, the only wildlife we saw were hummingbirds, although we could hear squawks of a larger bird in the bushes. Just after sunset we went to the bar to see how busy it was and found a reasonable amount of people in the amphitheater watching the sunset. We saw the tail end of it and it was nice, but that's about all we have to say about it. We wouldn't push anyone out of the way to get here to see it, but we'd look at it if we were already here. We realize that sounds jaded, but we used to live on a hillside facing the ocean, so we've pretty much seen the sunsets. However, if you'd like to stop and have a nice drink with your sunset, this is as good a place as any to do that. Our dinner hour rolled around, so we pulled ourselves together and changed out of t-shirts and shorts. The dress code around here is very casual, but most people made an effort to dress properly for dinner, meaning they put on long pants and a shirt. The restaurant terrace was about half full and we were told by our waiter that it was fairly slow tonight. Last night he said they were beyond busy and every table was full. The service tonight was slightly more coherent than it has been, meaning there weren't any lengthy lulls in the process. However, a word to the wise is do not order anything that says it is "from the grill". What that means precisely is that they will bring whatever meat or fish you ordered out to the terrace and throw it on an electric griddle near your table. And we do mean griddle, as in pancakes, not a grill. In theory that may not sound too bad, but what happens is that they bring your plate full of side dishes out, any other entrees the other party has ordered, and leave them in front of you while they heat the griddle and cook then cook the shrimps for fifteen minutes and then the meat for less than three minutes, no exaggeration. Needless to say, that leaves everything else ice cold. Besides that, we'd judge everything cooked on the grill to be nearly inedible and the baked potatoes were literally refrigerator cold. Oh well, you can't win 'em all. We did have some tasty drinks and the lobster bisque and the tomato-mozzarella salad were both very good. The waiter brought a condiment server with four sauces in it and a plate with some fried onions topped with cream cheese right after he took our order. We weren't the only diners baffled by these items because we heard another party asking what they were and why they were there. The answer was, "They are for your main course." OK, then why not bring them with the main course instead of with the drinks? Very odd. One of our entrees, a beef filet with béarnaise sauce was very good, with the meat being of very high quality and a generous size. The Surf and Turf from the grill was God-awful. It consisted of three thin slices of beef that probably wouldn't be too bad cooked in a normal fashion, plus three jumbo shrimp that were way overcooked. Both of them tasted like grease more than anything else. The menu says the grilled items are only available on the terrace. If we were to order those items again, which is highly unlikely, we'd ask them to cook it in the kitchen like they did during lunch. By the way, the dinner menu is the same one from lunch, so if you were to stay here for any length of time the choices would get rather repetitive. We both had dessert also, one a "house special" chocolate cake that was way too dry and an average crème brulee. We chatted with our waiter trying to find out how many hours he works a day. He was our waiter at breakfast this morning also. He didn't understand the question, and just said that the pay is good, so he likes to work here. He tried to convince us to go party in Jaco, which is the farthest thing from our mind. He didn't mean party with him, by the way, he just thinks we are party animals. Why, we have no clue. There really isn't anything to do here after dinner except sit in the bar adjacent to the restaurant terrace in the same uncomfortable iron chairs. We decided to pass on that idea although the weather was pleasant enough. The pool area was pitch dark, but the gate was wide open. That didn't seem like the best idea to us. Like we said before, an accident waiting to happen. Back at the room we had left the outside lights on. Talk about bugs! There was every kind of flying insect one could possibly imagine gathered around the lights. Thank goodness we had the door closed. They were also plastered all over the outside of the glass doors. As long as they are outside, no problem. So far there haven't been any problems with insects actually getting inside, but we think that's fairly inevitable at some point. Nothing else significant happened after we returned from dinner and with nothing else to do we cleaned up and went to bed. Neither of us woke up until 11am, so we missed breakfast and went for lunch instead. As usual we were one of only a handful of other couples in the restaurant. The service continues to be earnest, but dysfunctional. One really has to have a sense of humor and a lot of patience to stay here. We'd probably stay here again, but anyone who is the slightest bit high maintenance should avoid it like the plague. Lunch was satisfactory today. The Spanish Omelet was an individual quiche filled with potatoes and cabbage. It was filling, but not very interesting. It would have been good topped with salsa though. It came with a green salad that was very fresh and tasty. One thing we can say about the food is that it is fresh. The other entree was Chicken Fajitas that was very good. We had a dessert that was diced tropical fruit with mint and ginger. It was surprisingly spicy from the ginger, but was also very good. We'd order it again. On the way out we made our dinner reservations for tonight. The waiter tried to talk us into going to the "gourmet" dinner on the terrace at Mirador tonight, but we prefer the casual food at the Amphitheater. We saw the Mirador menu and it is all snails and smoked salmon. We'll have plenty of that on Crystal Symphony, no need to pay $57.00 for it here. By the way, that really is the price. There is a $35, $57, and $75 menu option for Mirador. Luckily we haven't run out of options from the Amphitheater restaurant yet. 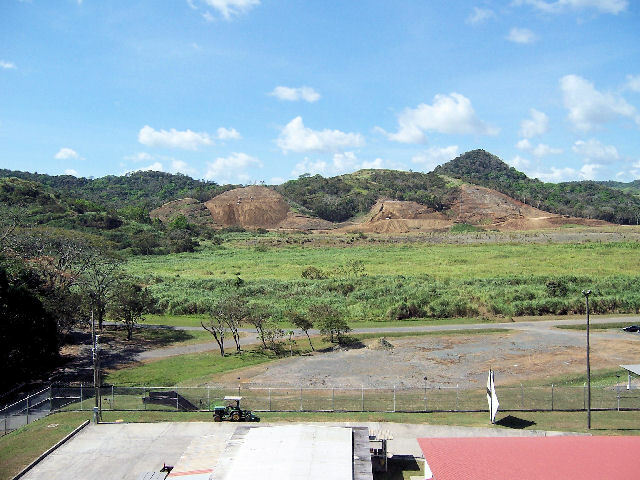 We looked at the reservation book and there was only one reservation for Mirador and two for Amphitheater. After eating we decided we'd wait for the next shuttle to the private beach to check it out. Supposedly the shuttles leave the hotel on the hour and return on the half hour. We waited for the 2pm shuttle until 2:15pm, then decided we must have missed it. How, we had no idea since we were sitting in front of reception the whole time, but who knows? Oh well, we'll wait for the 3pm instead. Off we went to wander around and kill some time. We came back before 3pm to wait, but this time we sat directly in front of the lobby where they couldn't possibly miss us. We even asked the greeter, he radioed someone, and then said, yes, this is where we wait and it will be here at 3pm. OK fine. 3pm comes, nothing. We wait a few more minutes and a guy comes out of reception and tells us that the shuttles aren't running today because the road is "very bad" and is being repaired. We swear this place is as amusing as Fawlty Towers. Everyone means well, but they don't have any training at all apparently. He said he'd call us when the road was fixed, but we'll believe that when we see it. None of this was a big deal, but shouldn't someone have known an hour ago that there were no shuttles today? By the way, we don't buy the "bad road" excuse. The weather has been about as pleasant as it can get. No rain, no clouds, not too hot, nothing to mess up the road. We'd guess that this is a slow day and they just didn't want to staff the beach bar. Oh well, at least that killed most of the afternoon. We figured we'd go sit somewhere cool and have a drink, which we did by the pool. The service there is rather comical. The poor guy who took the order (we went to him, he didn't come over to us) didn't know how to carry a tray with two drinks on it. Watching him try to get all the way across the pool deck was worth the price of admission. The poor guy was sweating bullets by the time he made it over to us. As is the norm around here, he brought the bill quite a while later and never asked if we wanted another drink. Seems like a missed opportunity for the hotel to make more money, but nobody ever asks if you want another. That seems like a clear sign of a lack of training because every hotel trains employees to maximize profits whenever possible. Come to think of it, nobody ever asks if everything is OK either. We really do believe it is a lack of proper training because all of the staff members appear to care and they couldn't be any more pleasant. Once we tired of wallowing by the pool, we moved to our own private pool area and hung out there for the rest of the afternoon. The weather has been clear and beautiful since we arrived. Our deck area is always in the shade, so even if it is hot it isn't unbearable. We debated briefly about actually going in the pool, but the water is just too cold. It does look nice though and the sound of the waterfall is pleasant. The pool guy has been working on fixing the pool pumps since we arrived. We didn't notice anything wrong with it, but he told us he is now finished with it. The only difference we notice is that the water is going over the infinity edge. It would really be nice if they provided rafts or something for the pool. Even if the water is cool, you could at least float around in it. A flock, well OK, three, toucans visited the tree next to our patio while we were sitting there. It was like the Enchanted Tiki Room live and in person. There is a large tree by our pool that has small clusters of pink flowers all over it that the hummingbirds and butterflies frequent all day. 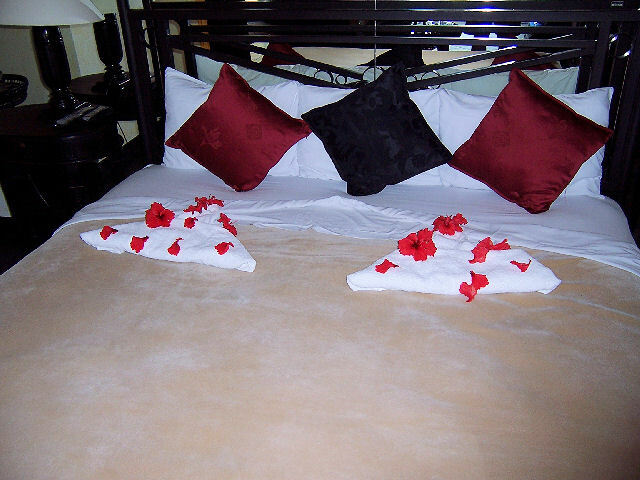 Our bed had been decorated with towels covered with hibiscus flowers by housekeeping. We have no idea if this is the way it should always be done or if it is a once in a stay kind of thing. Our friend Benji called tonight to confirm that she and Marco will arrive around lunchtime tomorrow to take us for a drive and/or for lunch somewhere. We will to do almost anything they suggest. Shortly after Benji called a maid arrived with a pitcher of ice, announcing herself by tapping on the side window and calling out, "Hola, hola". We've never had ice brought to us before tonight. 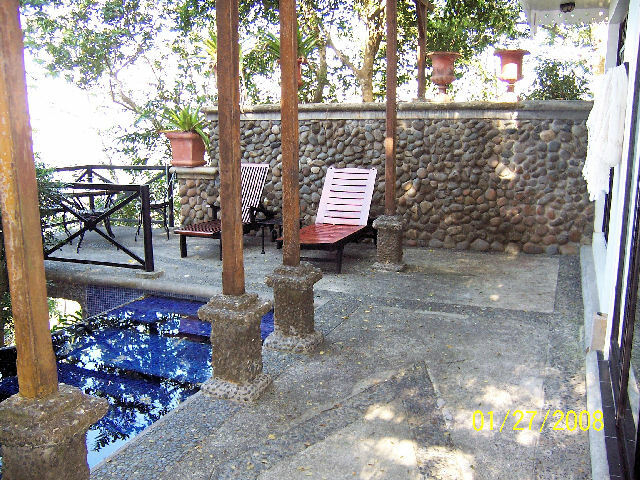 Here are some photos around Villa Caletas we took this afternoon: Reception Bldg., Reception, View over Reception, Gazebo, Stairs to Mansion, Decorations, Walk to Mansion, Mansion Patio, Mansion Seating, Pool Deck, Pool, Our Gate, Walk from our Gate. Next stop, dinner as usual at the Amphitheater Restaurant. Since this afternoon, the reservation list had filled up, but the only occupied tables were on the terrace where the hotel guests are seated. There are ten tables on the terrace at the most, so it isn't at all crowded even if they were all filled. We were very pleased with our food tonight...a Pasta with Seafood entree and the Chicken Satay. We finally figured out that the fried onions topped with cream cheese are to put on the bread. It was very tasty, odd, but tasty. The waiter really ought to say what it is for because nobody seems to figure it out that we have seen. The bread is always very fresh, so we assume it is made here. The Chocolate Profiteroles dessert was outstanding. It consisted of two balls of puff pastry filled with vanilla ice cream and topped with milk chocolate sauce. We'd gladly order anything we had tonight again. The pace of the service was slightly better tonight, but it's still a very strange procedure. The waiter just comes up and wants to take your order, no offer of cocktails even though he brings a cocktail and wine list with the menus. If you order drinks it throws him off. It seems like a strange oversight for a hotel not to at least ask if you want drinks when they are such a huge profit maker. By the way, the drinks we have had have been very tasty, but light on the alcohol content. We're lightweights, so that's fine with us, but they are about $7.00 and should be stronger. We can't imagine how many drinks the party at the next table must have had in order to reach their level of happiness during the meal. We've never even begun to get a buzz off the drinks we've had so far. We got out of bed around 9am and went to breakfast, which was good, as usual. The restaurant was busier this morning than it has been so far, but still had plenty of seats left. After breakfast we basically waited around for the arrival of Marco and Benji to take us on whatever outing they have planned for us today. We hung out by our pool watching the pool man cleaning it for over an hour. The poor guy just gets all the leaves out and a slight breeze has them raining down again. We feel guilty not swimming in it after all the daily trouble he goes to keeping it sparkling clean. One of us did sit and dangle our feet in the water to cool off at one point though. Benji and Marco arrived around 1pm. Benji had vaguely made fun of us for thinking our pool water was too cold, but as soon as she set foot in it she agreed it was too cold to get in it. 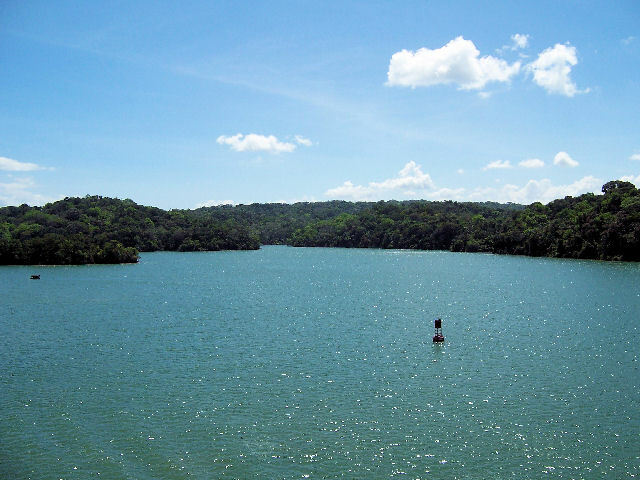 Marco's plan was to drive us through Jaco to Manuel Arenas Park, so we set off for that destination. After reading all of the horrible reviews of Jaco, we didn't think it looked all that bad. It is a little hodge podge, but it isn't scary or anything. There is a big Marriott resort nearby and there are many tracts of expensive houses being built in the area. Marco said that this area used to be a very sleepy place until foreigners started buying up the land and building houses here. Along the way we drove past several coconut oil farms, rice fields, and the like. We never made it to the national park though because a bridge was out. We were sitting in a long line of cars waiting for the traffic to move until Marco asked a kid walking along what was going on. 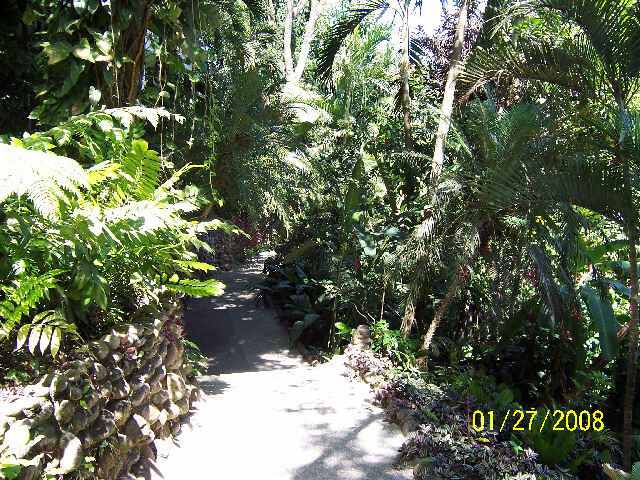 He informed us that the bridge is closed for several hours, so we turned around and went back toward Villa Caletas. 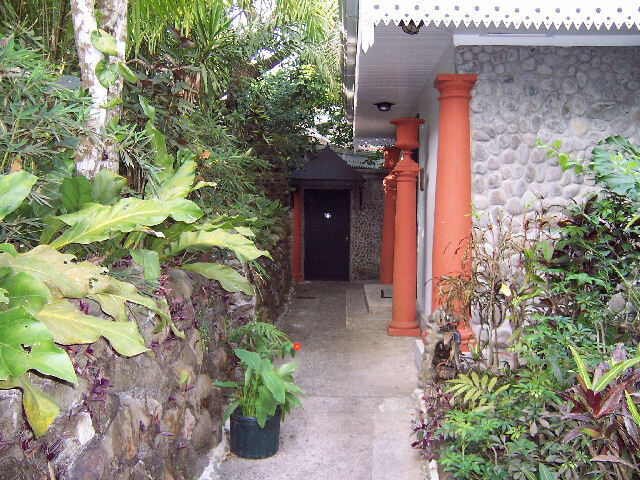 We continued beyond the entrance to Villa Caletas for a few miles until we arrived at Steve & Lisa's Restaurant, a place Marco declared was good to eat. He was right, we both loved our meals and the price was more in line with what one expects in these parts. The view was spectacular, right on the beach with a dead on view of the sunset. Frankly, this angle on the sunset is way more spectacular than from Villa Caletas, so if you're ever in this area looking for a sunset, stop at Steve & Lisa's for a bite to eat. There were only four other people in the place, so it didn't have the touristy feeling Villa Caletas gets at sunset. We had a very pleasant conversation about a variety of things related and not to the ships. Marco and Benji will be arriving in South Africa the same day we return from our cruise in Los Angeles. They brought us a bottle of champagne today, which was very thoughtful. Maybe someday we'll make it to South Africa for a visit, although it is way more likely they will come to California before we get the nerve to embark on the 24-hour flight to get to them. 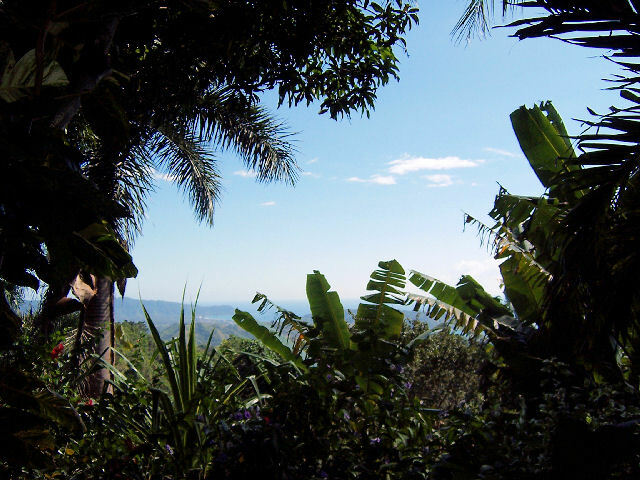 Back at Villa Caletas, we sat with Marco and Benji on the edge of the Amphitheater for some drinks and more conversation. They decided they had to head back at around 7pm, so we saw them off, then went to the room to change for dinner. Not that we're at all hungry having just stuffed ourselves an hour before, but we can't miss a meal can we? Villa Caletas' parking area was packed with cars and tour busses when we arrived. Many people were in the bar, but it seemed that most were here for an event in the Mirador Restaurant. The point is that they had no impact on us at all. We only saw them when they were leaving. Our dinner reservation was for 8pm in the Amphitheater Restaurant. When we arrived the horrified waiter didn't have any tables on the terrace available, so he asked us to wait a few minutes in the bar, which we did. We would have been happy to sit inside, but he didn't ask us. The wait was short and was welcome since neither of us is the slightest bit hungry. Every table in the restaurant was filled until shortly after we were seated. Only two parties arrived when we did, so everyone else was just dawdling from the 6pm seating. The poor fools next to us ordered from the ridiculous grill selections, so we had to watch and smell their pork and fish items be incinerated on the electric griddle. We were smart and had repeats of a very good fish entree that is comparable to anything you'd get in a top-quality restaurant. We also had the Chicken Fajitas that were outstanding. Stuffed as we were to begin with, we also had salads and then sorbet for dessert. By the time we left, we were the next to last people to leave the restaurant. Apparently they have no idea when it will be busy or not because we were told they didn't expect so many guests tonight. It must make it difficult to schedule workers efficiently. 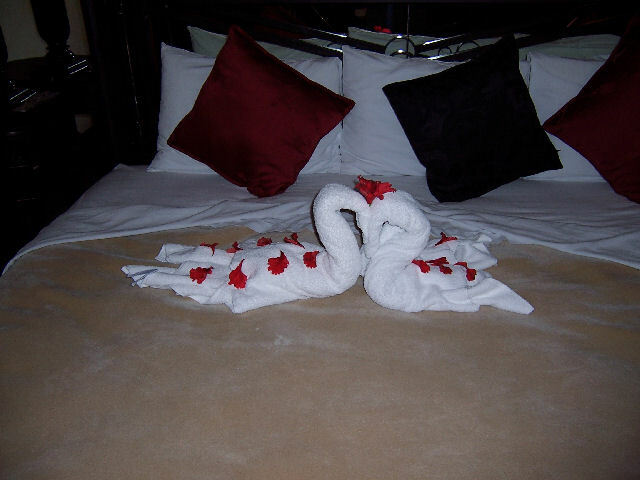 Back at the room we found an official turndown service complete with towel swans and hibiscus petals on the bed. I guess they expect anyone in a master suite to be into the romantic thing. Benji said they did the same thing for them when they stayed here, so it seems they should have been doing this kind of thing all along. Also, they fixed the lights in our foyer without us asking, so someone did check them and report it. Both of us agree we would rather stay here longer than move to the formalities of the ship, but such is life. After these relaxed days we almost dread putting on tuxedos and being properly groomed every day for the next three weeks. However, if it hadn't been for starting a cruise here we probably would never have come at all, so there is some benefit to it. We received an early wake-up call when something clambered on our roof. At first we thought someone was trying to open the sliding glass door, but nothing was visible. It must have been a monkey or something on the roof or in the attic. Either way, we weren't thrilled to wake up at 6:30am, but such is life. Breakfast was very good as usual. It is also a reasonably good value and the fruit is very fresh with an exotic variety that was a bit different every day. We were visited by one of those anteater/raccoon animals, but he didn't beg or bother anyone. We were back in the room getting packed up by 10:30am. We had a short chat with the extremely friendly pool man who seems to have decided we're pretty good guys. We proved it by giving him $10.00. Our car and driver arrived at 11:00am, so we had to scramble a bit to finish up. We were happy to see that it was Julio again since he had been such a good time on the way here. While Bill helped load up the car with our piles of luggage, Dave went to Reception to check out. They forced him to fill out a lengthy questionnaire about our experience. There are questionnaires everywhere, so they must be aware that some people are not happy here. A manager type woman standing near the desk asked if we were happy and when told we were, she looked so shocked that Dave said, "Shouldn't we have been?" Then she said that while most people are happy, "Some people are never happy, you know?" Yeah, we know, but we do think there is some validity to the complaints about this place mostly because of the price point. If it was about $100 less per night it would be fine, but the price is more like you'd expect at a 5-star hotel, but it is really a high 3-star based on service and amenities. We'd definitely stay again because we actually liked it once we got used to it. The drive to the port was short and easy, only about 30 minutes, if that. The busloads of guests hadn't yet arrived from San Jose, so the check-in line was fairly short. We had to pass by a table with immigration officers checking passports and then to the ship's check-in. There were so many agents checking guests in that there was almost no wait for that part. We were surprised that they took our credit card at check-in. That has never been done in the past and quite frankly it is a bit Carnival-esque for Crystal. From the check-in we had to walk the length of the pier, which was about 100 feet or so. Some taxis were dropping people off right at the gangway, forcing those guests to walk back to the terminal to check in. Our driver did it correctly, so no complaints from us. Boarding the ship was the same as usual. Walk on and have your ID card scanned, put your stuff through the X-ray machine, and then check in your hand luggage at a table in the lobby. From there it was straight to the dining room for lunch. We were told the rooms would be ready at 3:00pm. Our lunch waiter was Alexander, he seemed like he'd be a good time. The menu was different from the past embarkation luncheons, which was nice. Everything we ordered was very good: Cream of Vegetable Soup, Pasta with Sun-Dried Tomatoes, and Roasted Chicken. We didn't have dessert because the last thing we need at this point is more food. Gianlucca rushed over to the table and exclaimed, "I know you!" We've known him forever, so it's very nice to see him whenever we cruise. What was going on around us was so ridiculous that all we can say is OH MY GOD! We know the staff has the patience of a saint, but how they can get through months of this crap we have no idea. After lunch we wandered up to the Lido Deck, but it was way too hot to sit outside. We decided to go down to see if our room was ready, expecting it not to be. However, our butler was standing in the hallway practically waiting for us. He recognized us because a guest on a previous cruise had shown him our picture from the site and told him about us, etc. By the way, whoever you are, PLEASE don't do that in the future. It stresses out the staff and they fret over it until they meet us in person. The anticipation of serving guests who have a high number of cruises racked up is stressful enough without adding the element of internet reporting to the mix. Please think before you speak next time. Anyway, our butler is Teodor, who is very friendly. We didn't know him before arrival, but we're sure he'll be a lot of fun. We chatted with him for a while, the usual room intro plus general chit chat and "getting to know you" kind of things. They had prepared the room with all of our logged preferences from the past. He even knew we had requested a certain butler long ago who hasn't been with Crystal in probably 10 years now. We had just stepped out the door to take the laptop to be configured when our stewardess, Lenka, popped in. She seems very pleasant and friendly. Her assistant was busy assisting someone in their stateroom, so we haven't met her yet. Lenka checked to be sure she had covered all of our regular preferences, which she had to the letter. With the introductory procedures out of the way, we wandered down to the computer lab to get set up for internet access. We'll probably use half of it just by uploading the Costa Rica portion of the trip so far (it took 1.5 hours to upload, by the way). The price is $300 for 25 hours of internet use, but there are shorter times for less money also. The computer was already set up from the last trip, so that part was easy and there was no charge. It was just a matter of changing a password and we were all set. On the way to the elevator we ran into Remi, the dining room maitre d', who came over to greet us. We've known Remi forever and he's always fun and interesting. He confirmed that Benji had indeed made sure we got the right table. That was unnecessary, but very thoughtful of her to do all that. What's more amazing is that headwaiter Albert had remembered exactly where we usually sit on this ship when we haven't seen him in years. Back at the room we unpacked and rested up until the lifeboat drill that is scheduled for 8:00pm. We are scheduled to sail at 9:00pm, but we have been told by several crew members that we are most likely leaving at 8:00pm instead. The lifeboat drill was as usual except it was very hot and humid. We ran across Gene, a sommelier we've known since he was a deck steward. He's always happy to see us and vice versa. This batch of passengers seems to be an older group than usual, even for Crystal, so standing in the heat for any length of time wasn't the best idea. Other than a longer than normal lull between the roll call and the speeches, the drill was the same as always. When we returned to the room we found it already turned down and ready for the evening. How efficient is that? One change we noted was that instead of chocolates on the pillow there was a small box of Crystal Cruises chocolates "to enjoy during your cruise." This seems like a nice change to us since we just threw the chocolates in a drawer anyway. This way we night actually eat them. People who don't eat them can take them home as a nice little gift for someone. The Pillow Menu was on the bed. This has been around for a while, but we haven't received one the past couple of cruises. This assortment has always been readily available. The menu is just pointing it out. We received an invitation to a Crystal Society dinner in Jade Garden for later in the cruise. We're not sure we will attend or not. Group dinners are not really our "thing", but sometimes we'll go anyway. We'll see. There was only time to change our shirts into something less wet before going down to the dining room. We arrived about five minutes after it opened and there was still a short line. Nobody seems to realize there are two doors and if you enter on the left side there is rarely a line. There were some screaming children ahead of us that annoyed the man in front of us. We don't like it, but as long as they aren't near us we really don't care. However, we think it is completely inappropriate for small children to be at the late seating. The dining room was jam packed tonight. There were a few people missing from the large tables, but not many we could see. The noise level was deafening. It took a lot of concentration for us to have a conversation. The Crystal Dining Room has never been a sea of tranquility, but we thought the new design had helped with the noise level. Apparently not, but at least it looks really nice. Tonight's dress code is Casual. Click here to view the Dinner Menu (You will need Adobe Reader to view menus. It can be downloaded free HERE.) We ordered a Sautéed Shrimp with Vegetable Salad appetizer, the Fruit Cup, the Chilled Strawberry Soup, a Spinach Salad, the pasta course, the Fried Chicken Breast Stuffed with Coconut Dressing, and the Snapper fish entree. The shrimp appetizer was satisfactory, nothing special. The chilled soup was watery and very disappointing since it is usually a favorite. Honestly, they could have served strawberry milk from a carton and we wouldn't have known the difference. Our waiter said that the spinach salad wasn't spinach, but a mixed green salad. He didn't say why. Turned out it was spinach after all. He said they just got a new supply. Between seatings? Hmmm. The pasta was good, not exceptional. Both of the entrees were outstanding with one caveat. You may recall a few years back we complained that the portions were microscopic. If those were microscopic, these were sub-atomic. For example, the chicken breast was no more that one-fourth of a breast. On the plate were five, count 'em five, snow peas, and a 1" x 2" cube of white rice. The fish was no more than four bites assuming it was cut up into the tiniest possible pieces. Oh, and that came with four tiny chunks of potato and a slice of something that looked like a potato chip. Both of the dishes were outstanding flavor-wise and beautifully presented, but who are they kidding with these tiny portions? We're not exaggerating to say that they were both smaller than the appetizers. Now, let's talk dessert. At first we were thrilled to see several brand new selections on the menu in a box at the top specially chosen by the pastry chef. We wisely choose one of those, the South Beach-Art Deco (described as Liquid Chocolate something or other), and a safe stand by of the red orange sherbet. Thank goodness the sherbet was good because the other item was God-awful. It looked really beautiful, but it tasted like nothing and had a weird wet grainy texture that was unpleasant. The "liquid" part was white chocolate syrup, we think. Basically it just wasn't worth eating, so we didn't. Our waiter was horrified that we didn't like it. As we always say, we're in no danger of starving, so don't worry about it. Our senior waiter is Dusko and the waiter is Marius. Both of them were very nice and friendly in spite of the dining room being fairly chaotic. Dusko needs to learn really quickly not to recommend menu items unless we ask. God knows we've seen this stuff almost as much as he has. We'll never comprehend the logic of pushing entrees when they have no clue what we like. For example, he strongly suggested several times that we choose the veal or the fish. We're not offended by any of this, it's just tedious if it continues (which it won't). We've both been waiters, so we know where we're coming from on this subject. The proper way to make a suggestion is to say something like, "The veal looks very good tonight," or "The chef recommends the fish," and leave it at that. Several long-time crew members came by to chat during the meal. Albert is the headwaiter to whom Benji first spoke about our table. He appeared to be genuinely overjoyed to see us, which was nice. He said we are so familiar that we are like part of the furniture. We haven't seen him since the 2003 world cruise. It turned out that Gianlucca is our sommelier, another pleasant surprise. Our headwaiter is Martin. We've had him in the past and he's always very nice also. Come to think of it, who isn't around here? The Filipino guys always fawn over us in the extreme and that certainly continued tonight. Remi also stopped briefly at the table. He's always a good time. There was a change in the way the "homemade cookies" are served with dessert. In the past the waiter would bring a plate of cookies to each table, most of which were never touched (not to mention that they were pretty bad). Tonight he carried around a silver tray and handed them out to guests who wanted them. That's a big improvement in our book and saves a lot of wasted food. However, the waiters need to be sure to offer it to every table rather than picking and choosing. The Evening Entertainment is the usual Welcome Aboard show featuring the "Applause Applause" opening number and closing with selections from "Grand Hotel". There will also be a performance the the Acapella Quartet "The Castaways". All of that sounds appealing enough except the opening number which we know from past experience is nearly unbearable. One of us went to the show just so we could report on it. The ensemble parts are what they are and you already know how we feel about them. The cast was fine tonight and they do the best they can with what they're given. The a capella group was very good and we look forward to hearing more from them during the cruise. We move one hour ahead on the clock tonight. By the way, the decor in the penthouses has been updated since we were here last. In our opinion it is an enormous improvement. Gone are the pastel pink and blue color schemes and in are earth tones and new, comfortable upholstered chairs and a sofa bed. The new acrylic table lamps are quite nice also. You will find new photos to compare in the Symphony Photo Gallery. The glass door to replace the shower curtain is nice, but decor-wise the penthouse bathrooms are ready for an overhaul. There was a voice mail message asking us to come to the front desk because they forgot to get our signature for the credit card at check-in. That's what they get for doing it the Carnival way. We also received a letter from the Crystal Society Hostess informing us of our 45th Milestone rewards: Private transfer to and from the ship (which we've already used) and $100 in free laundry service per person (which we will use!). These are extras for being in a Penthouse. Today's weather is overcast and not as hot as it has been. The sea is calm. We were awake by 9:00am, but didn't bother to emerge until lunchtime. Another thing that is ready for a makeover is the bedding. It isn't uncomfortable particularly, but the mattresses need to be upgraded to compete with other cruise lines that have installed plush hotel-like beds. The linens are top quality though. There is an Asia Cafe buffet by the pool for lunch, so the Lido isn't open today. We went to the dining room where there are always selections consistent with whatever the theme is at the deck buffet. Click for the Luncheon Menu. On the way to eat we stopped by the front desk to sign the credit card form that was overlooked at check-in. The dining room was relatively full which means the pool deck must be packed. Albert told the waiter at the door to seat us at our regular table. We don't have many rules about where we sit at lunch, but it was still nice of him to do that. We were served by our regular waiters and they were friendly as usual. He made a recommendation, but it was what we would have ordered anyway. We ordered the Vegetable Spring Roll appetizer, the Vegetable Broth from the Lighter Side selections, the Spicy Thai Soup, and the Spicy Orange Chicken. The spring roll was about the size of your thumb cut in half, but it was very tasty with a spicy sauce on the side. The soups were satisfactory and the spicy soup actually was spicy, which was nice. The orange chicken portion was so tiny that we both laughed out loud when the plates were placed before us. We immediately asked for another serving, so we ended up with enough. The first serving was so small that we were completely finished eating it by the time he came back with the seconds, which was maybe 5 minutes tops. The presentation was very attractive and the dish itself was very tasty, but when the food is this good we want more than three bites of it. The apple sherbet for dessert was less successful, but it wasn't bad. It had a weird fluffy/grainy texture and didn't taste like much. After lunch we went up to survey the pool area and found all of the tables inside and out full. The weather is very pleasant today, not too hot at all. It is overcast, but it didn't rain. We ended up lounging around in the room and on our verandah for the afternoon. By evening the sky was clear again. Teodor brought crudités and bleu cheese dip, plus a bowl of almonds as the snack for today. The dip was at the most two tablespoons, but that was plenty for us since we're not huge fans. However, they used to bring a regular sized bowl. He fixed our TV that had turned to black and white only. It was a loose wire in the back. He's a nice guy who's fun to talk to. 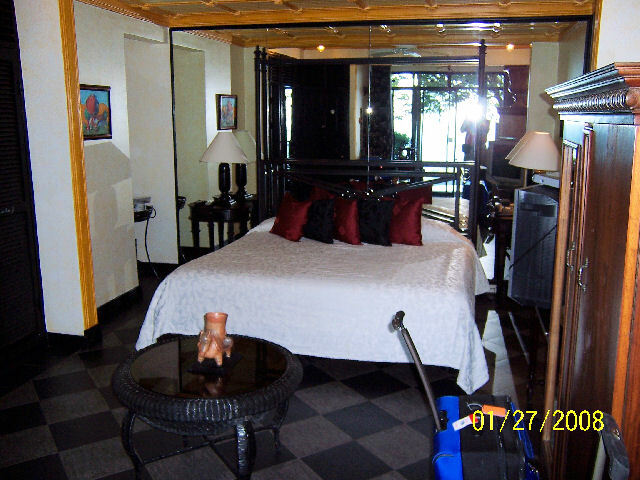 If you are nice to your butler they can really add a lot of enjoyment to the cruise. Come to think of it, pretty much any crew member will respond in kind if you take the time to get to know them. Make the effort and it will reward you many times over. Tonight's dress code is Formal for the Captain's Welcome Cocktail Party and Gala Dinner. Lenka said we had to wait for her so she could see us dressed up. Once we passed her inspection we wandered down to the Starlite Club for the Captain's party. One nice thing about the open plan of the new Starlite is that you can easily bypass the reception line, which is what we did by arriving from the aft elevators. Nonetheless, we ended up chatting with almost everyone we know, Paula Jean the Cruise Consultant, Herbert the Hotel Director, and Remi, along with a parade of Filipino deck stewards. Herbert ran over saying he had been looking all over for us. We wanted to meet his secretary Denise, so he brought her over later. 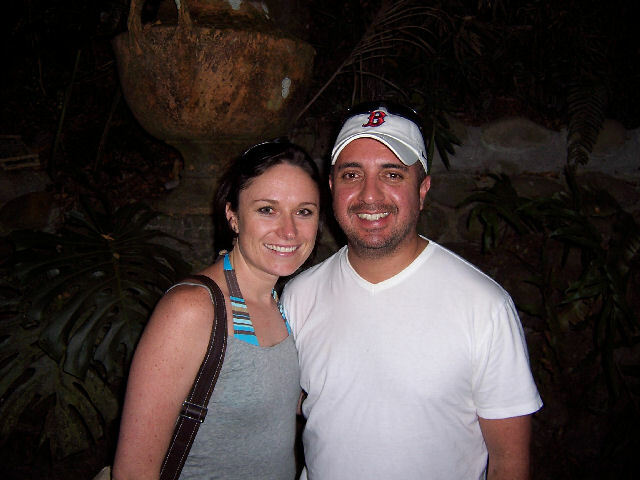 Her husband David works in Shore Excursions. We had met him when he was on Crystal Harmony as a bar waiter. We'd been acquainted via Marco for a while, but we hadn't officially met until tonight. Denise was amused because she had pointed us out to Herbert to be sure we are who she thinks we are, but he ran over to us instead. We've known him forever and we always have nice conversations with him. The party was as usual with the Captain reciting the same statistics he always announces. Most people seemed fascinated by it, so it's probably an acceptable thing to say, although we've heard it 46 times. We waited until most guests had left before making our way down to the dining room, but there was still a long line in the elevator lobby. Um, folks, there are two doors. Just go on the left side and there is no line. Click for the Dinner Menu. Take a look at the dessert menu in particular. Only the two desserts in the box at the top are different each night. All of the "Classic Desserts" are the same. In the past all of the desserts changed for every menu. This is not a wise trend. It screams cost cutting and mass market. The dining room was considerably less chaotic tonight, but still noisy. We chatted with Gianlucca and Remi again tonight. Remi was reminiscing about headwaiter Augusto and how much he misses working with him. We miss him also, but not enough to go on the Serenity unless we absolutely have no other options. Sorry Augusto, we love you, but you need to transfer back to the Symphony. The food tonight was outstanding for the most part. The fruit appetizer was less than half the amount it used to be, which is ridiculous. Come on, it's fruit, not caviar. The Captain's Salad was also much smaller than it has been, although it was very good. There has always been a sherbet course, but there was none on the menu tonight, so we assume that has gone the way of the dinosaurs also. The Pasta Special was tasty, but the noodles were slightly undercooked. We both ordered the Chateaubriand with a side of the Sea Bass. Thanks to Dusko, the meat portion was a good size, so with the added fish it was plenty of food for a change. Both the beef and the fish were delicious, as was everything on the plate with it. The Sugar Mill dessert (who comes up with these names?) was boring, but good enough. It was a thin layer of fairly bland pudding with a bit of whipped cream plopped in the middle and a stick of stale shortbread stuck in it. It would be OK ordinarily but it was too simple for a formal dinner. With only two options for dessert besides the "classics" that never change, the dessert menu really smacks of cost cutting gone wild. Tonight's entertainment is the production show "Cole!" that has been playing on this ship since at least 1995 and maybe longer. It features some beautiful and tasteful costumes without being over the top. It holds up well against most of the newer, more lavish productions, but it is getting a bit tired. Tonight's performance lacked energy and was just a bit off for some reason. There was one female dancer missing, but that didn't seem to be the main problem with it. If you had never seen it before you might not know the difference. Most people seemed to like it, but it didn't get quite the ovation it has in the past. It wasn't bad, but it wasn't great either, something we know it can be. On the elevator on the way to the room two women asked us if we had seen the show and if we thought it was fabulous. We said it was, but we've seen it over 40 times. They responded, "That's what everyone says who we talked to about it." They are new, so they liked it just fine, which is great. 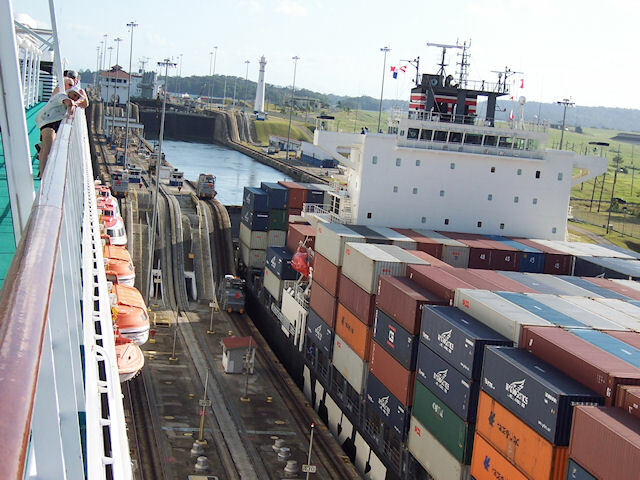 The Panama Canal transit begins at the crack of dawn tomorrow. Well, OK, maybe not the crack, but early enough that we won't see it. No matter, we'll see this end of it on the way back. By the way, the boxed chocolates that replaced the nightly turn-down candy are absolutely incredible. Nice choice Crystal. It was tough not to gobble them all down at once, they're that good. 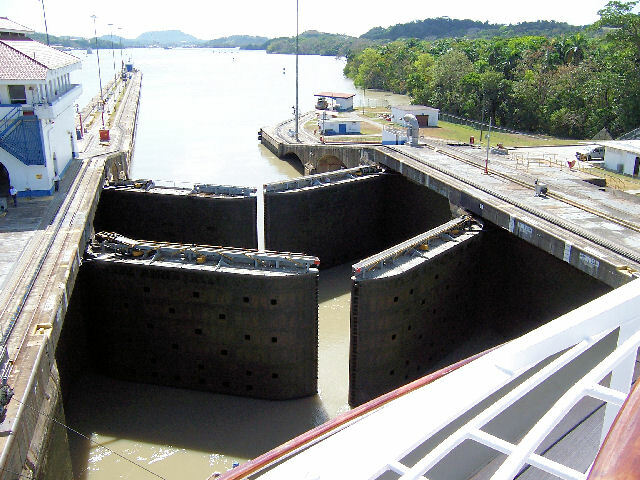 Don't expect a lengthy report about transiting the canal today. We've done this probably ten times, so while it is still fascinating to look at we won't spend a lot of time out in the heat watching it. We'll have some photos now and then that we'll link in the text so you can get an idea of the view. 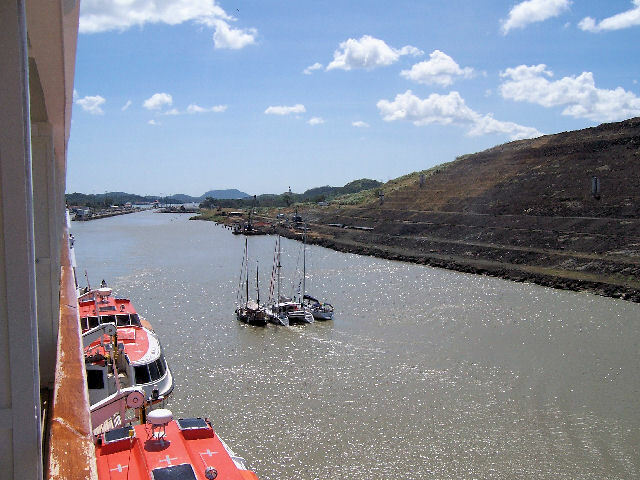 We were awake around 9:00am, but didn't bother going outside except to take a few photos from the vicinity of the Pedro Miguel locks. That was around 10:30am. 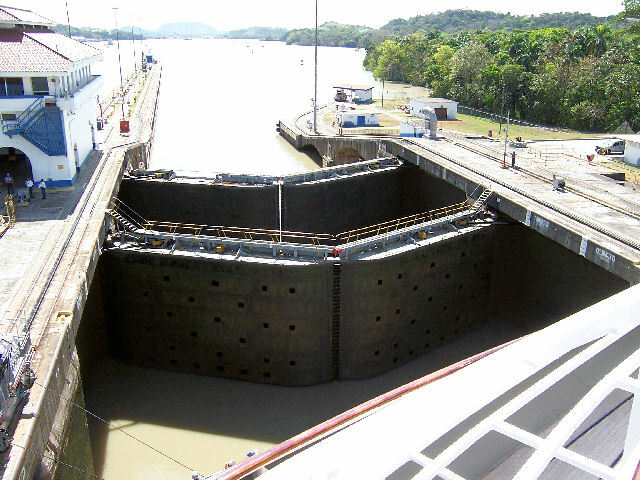 They are in the process of widening the canal and adding a larger set of locks to accommodate bigger ships, so there are tractors working on the hills preparing for that process. There is evidence of construction all along the canal. 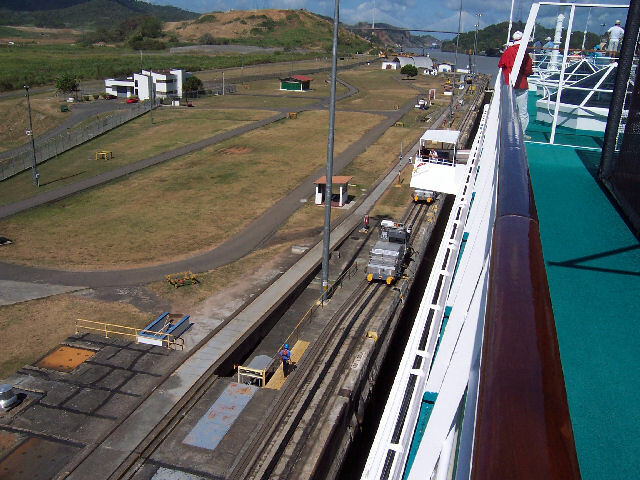 Passing through the locks is very efficient. 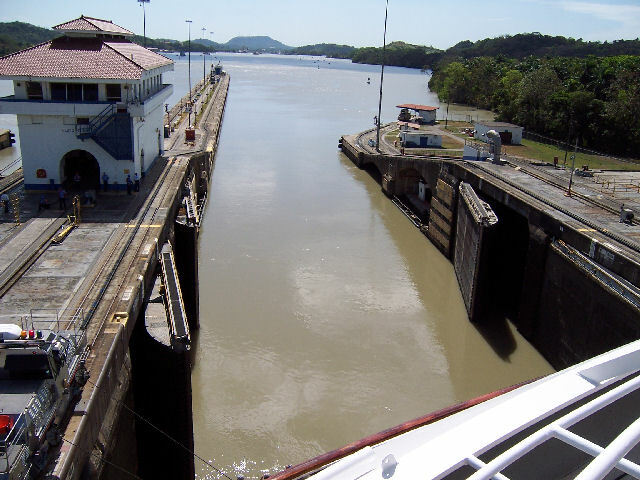 The ship sails into the lock, we're connected to the "mules" that keep the ship centered in the canal, the gates close behind it, the chamber fills with water to raise us to the next level, and the gates open ahead of us. Then, off we go. 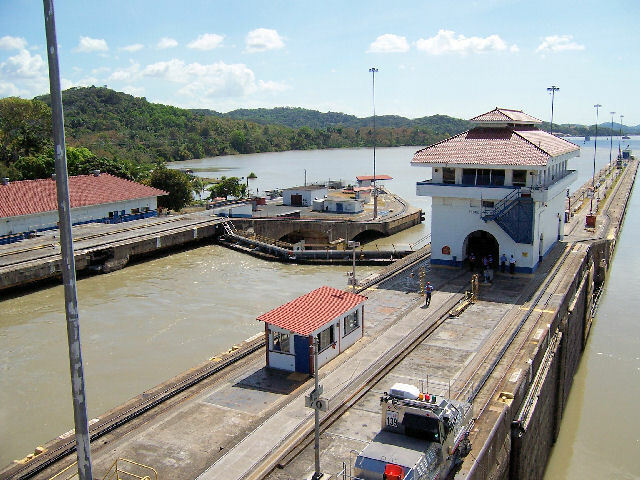 Here are more photos from the transit of the Pedro Miguel locks: Looking back, Mule Behind, Full Lock, Gates Closing 1, Gates Closing 2, Gates Closing 3, Gates Closing 4, Boats Waiting 1, Boats Waiting 2. After chatting with Lenka in the hallway for a few minutes, we went up to the Lido for lunch. While chatting we noticed that there are no trolleys in the hallway for the stewardesses, so we asked Lenka about it. They are no longer allowed to use them on the Penthouse deck, but they are still used on the others. The ship isn't designed to accommodate a system without the trolleys, but it is probably more luxurious not to have them in the halls all day. To us it really doesn't make any difference one way or the other. What's the difference of having trolleys in the hallway when there are vacuums, buckets, and bags of trash still strewn about? Click for the Dining Room Lunch Menu. There was a line for the buffet in the Lido, but it moved quickly enough. The selection of entrees was about the same as always with the Asian selection being the main thing different from the dining room. We always load up on it and it's usually a good choice. Everything we selected was above average to very good. The Swedish Meatballs were a bit too salty, but they were still edible. There was an extra table set up with pre-made sandwiches that were quite good. They were serving the same sandwiches and soup in Palm Court for the people viewing the canal crossing. By the time we finished eating, the entire Lido was full and people were searching for empty tables. We wandered out to the pool area to see if there was anywhere to sit, but all of the tables were occupied. The weather today is very pleasant, so we expected to find a lot of people out and about. We decided to settle back in the room to watch the view from our verandah. Here are a few random canal sailing photos from this afternoon: Canal 1, Canal 2, Canal 3, Canal 4, Passing Ship. After wandering up to the Sun Deck to check out the view, we went down to meet Jane Self, the Crystal Society Hostess. She told us her information said we were in the room, but not on board, so she didn't know quite what was going on. We informed her we would attend the dinner in a few days, then chatted with her for a few minutes. We always have to establish that we aren't terribly demanding even though everyone reading this probably assumes we are. With everyone out watching the canal crossing, we had no problem moving over to see Paula Jean, the Cruise Sales Consultant, to book next year's cruises. We took care of that business and chatted with Paula Jean for a few minutes before going back up on deck for more sightseeing. There has been an NYK container ship sailing along next to us all day. Crystal Cruises is owned by NYK, so while we were taking pictures of them, they were out taking pictures of us. 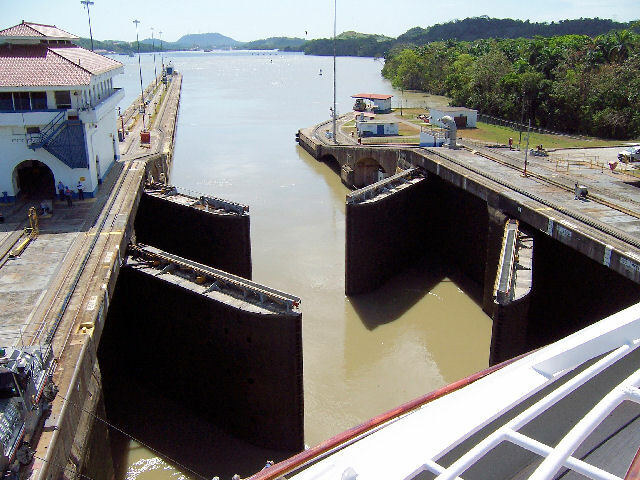 Here are some photos from the Gatun Locks, the eastern end of the Panama Canal. Beyond this is the Atlantic Ocean. 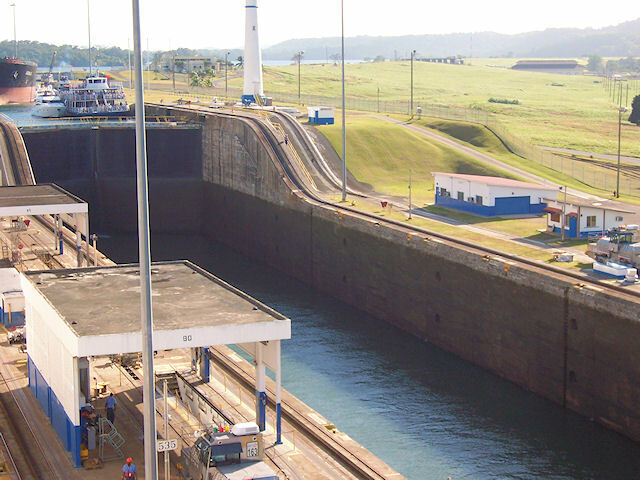 Gatun Locks Control Tower, Gatun Locks to the Sea, Just Vacated Adjacent Lock, The Final Lock. An interesting tidbit we learned today is that there are about 25 kids on board who are, to say the least, unruly. We wondered why there was a notice in Reflections about time limits for the spa and no unsupervised children in the Seahorse Pool. The notice also said no babies in diapers allowed in any pool or spa. From what we were told there are many in this group of kids who are completely out of control. Much to Crystal's credit, they are flying in Children's Activity Directors specifically to take care of this menace. They are supposed to arrive today. We'd charge it to the kid's parents, but obviously Crystal won't do that. We haven't been bothered by any children, but we aren't out by the pool either. We've heard them a couple of times running down the hallway screaming, but it doesn't last long enough to be an issue for us. Teodor brought guacamole and chips for our snack tonight and wanted to know what we want for tomorrow. For a short time there was a set menu for the canapés, but apparently that has fallen by the wayside (as it should). The procedure is the same as a special order in the dining room...ask the day before and you can get almost anything you want. Tonight's dress code is Casual. We were ready early, so we went down to the Starlite Club for drinks. Teodor's girlfriend Paula waited on us. She's very entertaining, by the way. There was a singles party going on in the bar area we weren't aware of until it started. We weren't in that section, so it didn't affect us at all. There were probably 30 staff members there and maybe 20 guests, so the staff just stood around the bar doing nothing. That's pretty much the norm at all of the parties. At least they are out and about if someone does want to talk to them. If we were in charge of these events we'd make them mingle, but it doesn't affect us one way or the other. The Photo Shop was finally open during hours when someone might actually be passing by, so we were able to purchase our boarding picture. It's pretty good for a change. We passed the group of rowdy children in the lobby. We had only seen a handful of them before tonight, but there were about fifteen of them on and around the fountain. One of the staff referred to them as "The Destroyers" when we asked about them. As mentioned previously, we haven't seen them do anything outrageous except perhaps be a little too noisy. This kind of thing is what Crystal gets for advertising specifically to families. Click for the Dinner Menu. The dining room was sparsely populated tonight, so it was relatively quiet. Well, let's talk about the food. Tonight's meal overall was the most mediocre we have had so far. The "tower" of chicken appetizer was bland, the fruit cup was about the same as always...no complaints about that, the pasta was undercooked again and had an off odor to it. The salad entree was beyond boring. It was edible, but that's about all we have to say about it. However, the "always available" red snapper entree was very good as was everything on the plate with it. The portion was reasonable for a fish selection, as well. We asked when the new reduced dessert menu was introduced and were told it started about ten days ago. The excuse was that it is to satisfy guests who are always asking for their favorite items. This way they are always on the menu. That's all well and good, but only one of them, the Chocolate Ooze Cake, is really something we know people ask for. The others are basic desserts, but certainly not something people request as a special order. Besides being an obvious cut-back, we also believe making only two new desserts per night leaves the chef more time to make fancier presentations. The special desserts look very nice, but every one of them has fallen flat as far as the flavors go. We had the "Crystal Dome" tonight and it was better than the past two, but not nearly as good as some of the regular selections we have had in the past. It seems a bit like they are trying too hard to make something innovative and missing the mark. Martin was amused when he offered us Cherries Jubilee and we declined saying, "You just open a can and light it on fire." That's pretty much all there is to it in case you didn't know. Not that it isn't good, but anyone can make it at home. We were chatting with Gianlucca who was a headwaiter for a while. He said he was always afraid someone would ask for the recipe. Speaking of Gianlucca, we had a very nice conversation with him about his family vineyard. He also has a small olive orchard and he makes specialty olive oils. He said that his entire family gets together to pick the grapes and make the vine, which was very nice to hear. He also told us about the recent certification of all of the sommeliers and how difficult the test was to pass after two weeks of studying. He's grateful for the extra training since it will be very helpful in the future as well. Kudos to Crystal for providing this extra training for them. The Evening Entertainment is "Violin Showman" Martin Lass. We did not attend the show. The weather continues to be nearly perfect with clear skies and pleasantly warm temperatures. The sea looks choppy, but there is little movement on the ship. We received the Guest List today. In case you are interested in that kind of thing, be aware that you must request a copy of the Guest List now as it is not provided automatically anymore. We were up by 10:00am, but as usual we didn't emerge until noon when it was time for lunch. An interesting tidbit from today's Morning Show was about taking pictures in the L.A. Cruise Terminal. A group of the staff members was taking pictures of a colleague's new baby who had come for a visit. The pictures were confiscated by security. How ridiculous is that? We've never heard you aren't allowed to take pictures in the terminal. Have you? Seems a bit excessive to us. After doing some laundry late last night we discovered two shirts had been ruined by the washing machine. They are full of huge blue stains. Bummer. We'll turn them over to the butler and see what happens. We do laundry in the self-service laundry rooms all the time and this is the first time we've had that happen. There is a Nuevo Latino theme buffet around the Neptune Pool today. We will skip it because the ship is full and it will be very crowded. Besides that, we've been told that over 600 passengers are first-timers, so they'll be attending everything to try it out. For anyone who cares about the group issue, there are several on board, but they haven't caused any problems we are aware of. No public rooms have been off limits at any time we have wandered by. We'd assume they are using the Palm Court for gatherings, but even that hasn't been completely closed at any time. The only way we know they are groups is that one group walks around wearing name tags and the other has big I.D. badges hanging on lanyards around their neck...MOO. Click for the Luncheon Menu. Lunch in the dining room was fine, not great, but OK. The crab croquettes were not plural, and sort of resembled corn dog batter with pink flavorless goo in the center. The only flavor it had was the sauce on the plate with it. The avocado gazpacho was the regular chilled cream of avocado soup, which we know is terrible. Since when is gazpacho a puree? The chicken enchiladas were good, as was the watermelon sherbet for dessert. We had the first weird, "Are you brothers? ", question today. A woman came all the way over to our table by the window to ask us. Then she suggested we might be twins which is the most ridiculous assumption imaginable. Brothers, maybe. Twins, not even close. Besides the fact that there is a nine year age difference between us, we don't look that much alike. Oh well, one down, 930 to go. Several of the bars and lounges will be overtaken by Super Bowl viewing parties tonight. Martin asked us about the game, which we have no clue about at all. He was basically asking what the point is. Like we'd know? The only advantage to all the parties for us is that you can get free hot dogs and popcorn if you are so inclined. Dave had a haircut appointment at 2:15pm this afternoon which is the only activity we have on the agenda for today. The stylist was a lot of fun, well worth the price of admission. Her hair cutting skills were top notch as well. We're always amazed when a haircut on board costs less than at home. Even with the price increase to $31, it is still less than home and for a better cut, too. We sat for a while by the Neptune Pool, had some ice cream and generally vegetated for the rest of the afternoon, as per our usual. The shops are really pushing the jewelry these days. Besides talking about it on TV, there was an article yesterday about the woman selling it in Facets and we received two ads on our mail clip this afternoon. Teodor brought our pre-ordered snacks of chicken quesadillas, which were outstanding. We may have to stay in some evening and order a few things like that again. He was suitably appalled by the shirts stained by the washing machine, but wasn't sure if he'd have any luck "fixing" it since it wasn't from the ship's laundry. Nothing important was ruined, but someone should check out the machines so it doesn't happen to someone else who may be washing something more expensive. Tonight's dress code is Informal. Many of the bars and lounges are being used for Super Bowl viewing tonight, which doesn't leave a lot of options for those of us not interested, but we'll survive. It is nice of Crystal to organize viewing parties for special events. They also do this for the Academy Awards, among other things. We passed by the Starlite Club and it was jam-packed with people watching the game. The Hollywood Theater was also packed. Crystal had a buffet of hot dogs, popcorn and beer set up that was very elaborate and popular. We're not sure, but it looked like there might have been other hot food there also, but since everything was covered we couldn't tell what it was. The informal dress code was largely ignored tonight because of the overwhelmingly popular Super Bowl party. We have no problem with that under the circumstances. It would have made more sense to alter the plans and make tonight's dress code casual even if it is a sea day. Click for the Neptune Dinner Menu. We're not big fans of the Neptune menu, so we're dining in Jade Garden tonight. Jade was popular tonight with most tables filled. Considering the throngs at the football parties we were surprised to see anyone in the restaurant. We're always fawned over in the extreme at Jade Garden and tonight was no exception. We thrilled the waiters and headwaiter Larry by re-ordering three times. First we had the chef's suggestion for tonight which was an appetizer plate with ribs, tempura shrimp and a spring roll, plus a main course sampler of orange chicken, crispy fried beef, and ginger lobster. First we ordered more of the chicken and the beef, both of which were very good. The lobster was fine, but we liked the other two items better. Then Bill ordered the Peking Duck while Dave ordered two pieces of tempura that turned up in front of him as four more pieces. Of course he had to eat all of it. The dessert of the Dim Sum sampler plate was outstanding. Everything on the plate was delicious. For some reason Larry insisted that Bill have the spumoni ice cream from Prego and he didn't turn it down. As you may know, Jade Garden will be remodeled during the upcoming crossing into the extremely popular Silk Road and Sushi Bar. We were informed that while the restaurant is closed for the change-over that they will move the Jade Garden menu up to one side of the Lido Cafe. That way no one on those cruises will miss out on having two alternative restaurants. We give Crystal a lot of credit for making the effort to do that. We also learned that the sushi bar will be located in the raised area of the current Jade Garden dining room. All of the decor will be changed to make it similar to the version on the Serenity. We're not so sure that stark decor is such a great idea, but the menu is just fine. We still remember how poorly received the original stark decor of Jade Garden went over with the guests and how quickly it had to be changed to what it is now. The Evening Entertainment is the newest production show, "The Envelope Please..." By "newest" they mean it debuted over a year ago, by the way. Crystal isn't exactly in any rush to come up with new shows these days, although we do hear there is something new coming to the Symphony soon. The football party was still going strong when we passed by on the way to the Galaxy Lounge. We arrived fifteen minutes before show time and there were only two other guests in the room along with six bar waiters who were watching the game in the control room. Eventually more guests arrived, but it never went over 40 people (yes, we counted). This show just doesn't work for some reason. The pacing seems too slow and there are some lulls that interrupt the flow, such as it is. It could probably be reworked to make it better if they're interested in doing that, but as it is now this isn't one of their best efforts. It is too bad they essentially wasted a production show by having it during the Super Bowl parties. We were told that the first seating didn't have many more guests in attendance than the late seating did. The first seating is generally packed for production shows. By the way, we noticed that they have finally covered up the fake neon fiber optic lights that flanked the entrance to the Galaxy Lounge. These lights haven't worked in years and weren't very attractive when they did. We mentioned this glaring oversight after our first visit to the ship after the recent remodel. The smoked glass panels have been replaced with opaque black that coordinates with the black and silver decor of the adjacent casino. Nice job. Invitations for the Crystal Society party on the 5th arrived today. 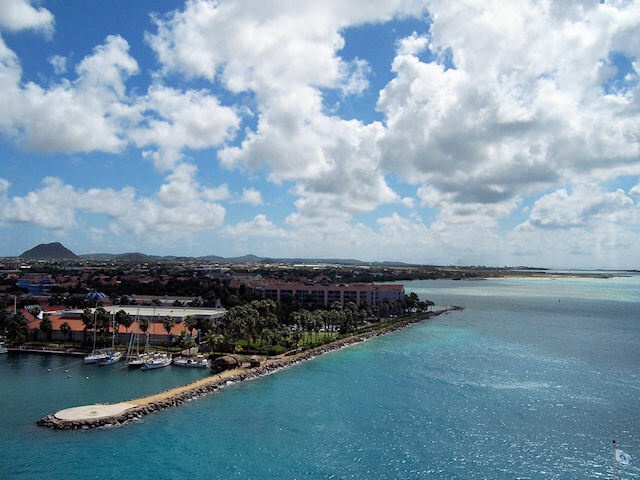 Aruba is a long, narrow island, located just 15 miles from Venezuela's coast, with a dry and sunny climate year-round. 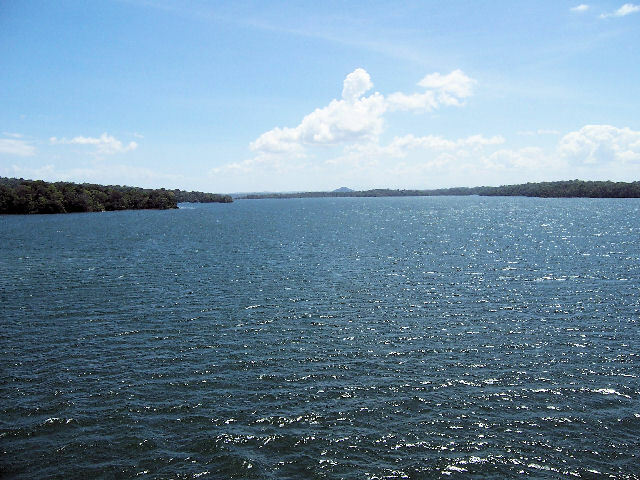 Its distinctive beauty lies in the stark contrast between the sea and its countryside. Next to arid deserts, which host an array of wild rock formations, curiously bent divi-divi trees and cactus jungles, are magnificent beaches that shelve into transparent blue waters. 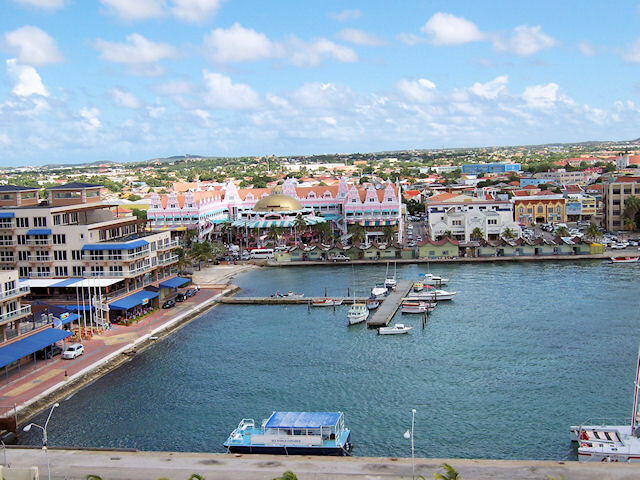 Combining Dutch efficiency and Caribbean charm, Aruba has become one of the most popular playgrounds in the Caribbean, boasting sophisticated resorts and casinos. 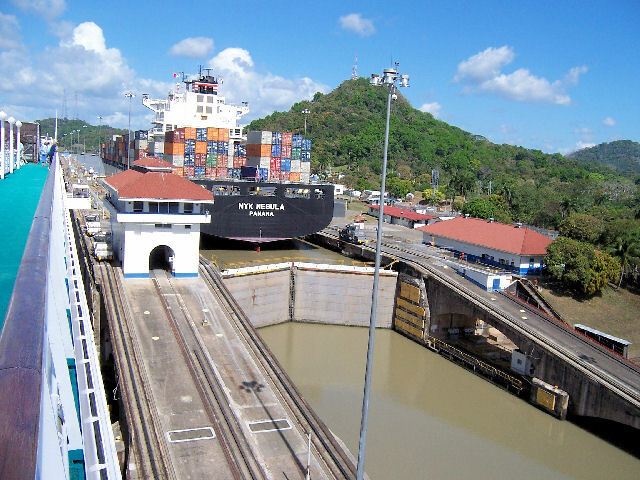 Click for Port Information. Yesterday was the last day of some sort of Carnivale-type holiday week in Aruba, so we're told that most of the shops will be closed while the natives recover today. Those that are open will only be open until 2:00pm. We don't care at all since we've been here several times before, but since this is the first port call we can imagine some guests are chomping at the bit to get started on their shopping. Since we were awake fairly early, we decided to try out the Late Risers Breakfast by the Neptune Pool. We've been there before and it was good, so we expected it would be OK, which it was. There were a few changes on the menu, but it was mostly the same. The peanut butter and jelly French toast is now apricot jam-filled. The PB&J version is served in the dining room. We ordered the Apple-Ricotta Pancakes and the Apricot French Toast. Both selections were nicely presented, but continuing the trend, the portions were tiny. We're not sure how they even got bread small enough to make French toast that was only a 2" square cut diagonally, but it tasted good. The biggest joke portion-wise was a serving of Apple-Chicken Sausage that was served on a dinner plate. The meat was 1"x 2" maximum on an otherwise empty plate. It was fine for a late morning snack, but not nearly filling enough for breakfast before going out for the day. Since we aren't going out, it was satisfactory and we'll know to order double portions next time. We keep forgetting to mention the new covers on the Seahorse Pool lounges. They are fitted white terrycloth slipcovers with the Crystal logo embroidered on them. The deck stewards change them after each guest. It seems like a nice addition. Now you don't have to touch the cushions everyone else has sat on. After breakfast we wandered up to the Sun Deck for our typical port photos. Here they are presented as we viewed them from left to right facing shore. The ship is docked directly across from the main street of town. 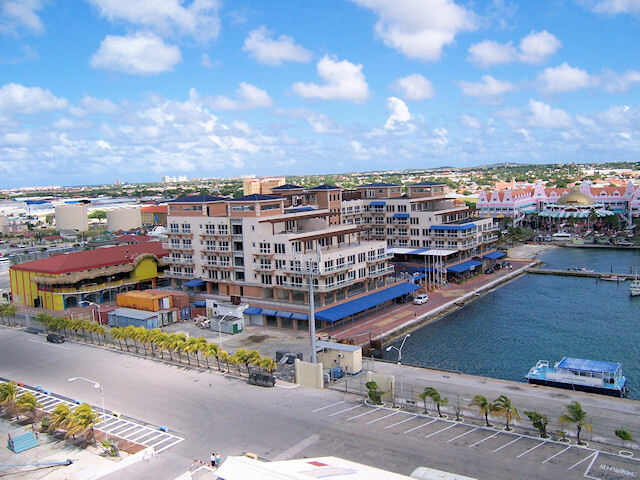 New Condos at the Dock, Royal Plaza Mall, Renaissance Resort & Crystal Casino, Marina, Airport, Reef. There is a Royal Caribbean ship in port with us, but we can't see the name. 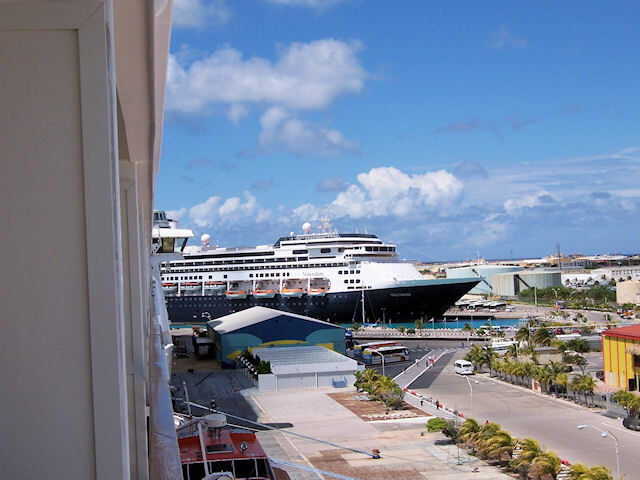 Another ship was arriving while we were outside that looked like a Holland America vessel. We were right about that as it turned out, it was the Volendam. Click for Luncheon Menu. We skipped our regular lunch time today and waited until after 3:00pm to have burgers and wraps at the Trident Grill. We're not sure why, but the service at the grill has been rather dysfunctional lately. It takes forever to get anything that has to be cooked to order. The weather remained pleasant all day, not too hot or humid and very breezy. After lunch we retreated to our verandah for the rest of the afternoon. About fifteen minutes before sail away Teodor arrived with today's canapés, a plate of fresh fruit. He spent several minutes setting it up on the verandah for us, then the skies opened up and it poured rain for about 30 minutes. Oh well, no big deal, we just moved back inside. That's the first rain we've had since we left home, so we can't complain about the weather. The laundry managed to get the stains from the washing machine completely out of one of the shirts, but Teodor insisted on sending the other one back for another try. We were all shocked they could resurrect them at all since the stains were dark blue on a red shirt. The one that went back had only a hint of the stain remaining, but it wasn't good enough for Teodor yet. Tonight's Dress Code is Casual. The Starlite Club was hosting a First Timers party, so we went down and waited in the lobby for the dining room to open. Click for Dinner Menu. Tonight's menu features the remnants of the 50's Dinner from the past. Almost everything we ordered tonight was outstanding. The shrimp cocktail was fresh and tasty, but the portion has been reduced to three shrimp. The watermelon gazpacho was about the same as it has been recently, a bit too watery, but interesting nonetheless. The soups are also being served in smaller containers than last year. Both salads were very fresh and interesting, again with half the amount of lettuce as last year. The iceberg salad is easy to gauge because it used to be a solid wedge that was a quarter of a small head of lettuce. It is about an eighth of a head now. There is not really any way to cut down a portion of prime rib, so it was a normal size and very good, as well. The fish entree was the usual 2" square, but it was outstanding. The Indian Summer dessert wasn't quite as described, but it was close enough. Basically it was a berry compote with something extremely crunchy sprinkled on top (by crunchy we mean it could have been ground concrete for all we know...it was rock hard). This was topped with a scoop of vanilla ice cream. We'll give them a lot of credit for serving something we consider relatively simple. The berry part of it was very good, but they need to change the crunchy topping to something less like gravel. Gianlucca showed us the test the sommeliers had to take in order to be certified recently. He said it was very difficult and now that we've seen it we agree. With the popularity of wine drinking these days Crystal is right on track with this program. The Evening Entertainment is a concert by vocalist Brenda Cochran. We hadn't seen her show before, so we were glad to finally see someone new perform on board. She deserved a larger audience than she had, but those who were in attendance seemed to enjoy her. We received an invitation for cocktails in the Captain's Quarters for the 6th. There is a slight bit of motion tonight which isn't to imply that it is rough by any means, just that we are aware of being on a ship in the open ocean. The birthday greetings began with a voice mail message from the operator and a card from the Captain. Later Dave got a call from the Crystal Society hostess forwarding a greeting from M.C. in the L.A. office, which was a nice surprise. Today's weather is overcast and the slight rockiness continues. It is very windy, so that's mostly the reason for the motion. The waves aren't large at all and this isn't anything we'd consider to be rough at all. It is very warm outside, over 80 most likely. This is Gala Buffet day, so we don't have a menu for the dining room. You are expected to play along and get your lunch from the buffet to eat in the dining room, although there is an abbreviated menu also. We went to the Lido, which was quite empty. With newcomers vastly outnumbering repeaters on this voyage we would expect most guests to attend the Gala Buffet. It is certainly worth participating in at least once. During the Gala Buffet there is a sushi bar set up in the Lido, so if you are into that sort of thing this is the day to get it. The selections we had from the buffet were very good, continuing on the recent improvements in the quality of the Lido buffet. The dessert pickings were a bit slim, but it wasn't sparse either. We had an appointment to meet Denise and David (ship's staff) for a chat at 1:00pm. That lasted until tea time began at 4:00pm, so apparently we had a good time. We're not going to report what was discussed, but we found it interesting. 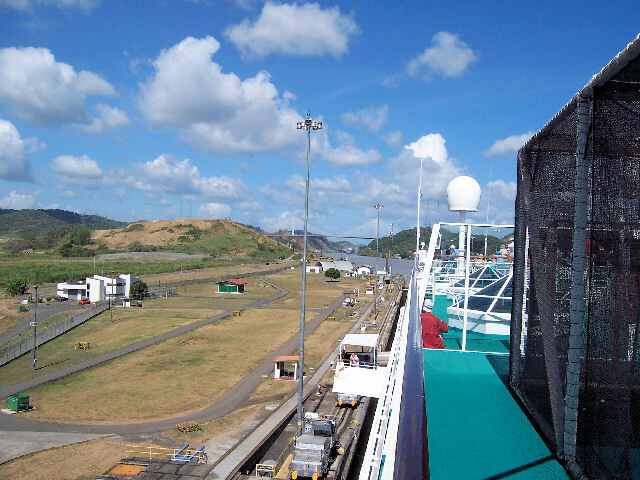 We're glad Denise mentioned that the immigration inspection will be in St. Thomas as guests go ashore because we hadn't planned on leaving the ship. The same thing happened one year when the ship stopped in San Diego and we didn't go ashore. Had we just walked off and back on we could have skipped the 5:00am immigration inspection in Los Angeles the next day. We've heard from several reliable sources this week that the next cruise is completely sold out, oversold in fact. Oh boy, a capacity cruise. This one is also full, so Crystal must be doing something right in marketing these segments. However, there is only one child under 17 on the next cruise, which should please anyone near the penthouses full of screaming children (that does not include us, thank God). Back at the room around 4:15pm, we just hung out waiting for our afternoon canapés. Teodor brought an expanded version of the fruit plate from yesterday, as requested. The expansion was his idea, but it was a good one since we didn't snack at all this afternoon. Tonight's Dress Code is Informal for the Crystal Society Party before dinner. There is only one party tonight because there are only about 300 repeaters on this particular cruise. The birthday greetings began at the party with Jane, the Crystal Society Hostess, then Paula, bar waitress (and Teodor's girlfriend). Next up was Paula Jean, then a parade of deck stewards working the party. Crystal ships are a great place to have a birthday because the staff really does want you to have a great day. We wouldn't get this much attention on our birthday at home, that's for sure. The party was the same as usual. The lowest number of cruises recognized tonight was 52, the highest 89 (or close to that). There is a guest on the world cruise who will soon reach cruise number 200. 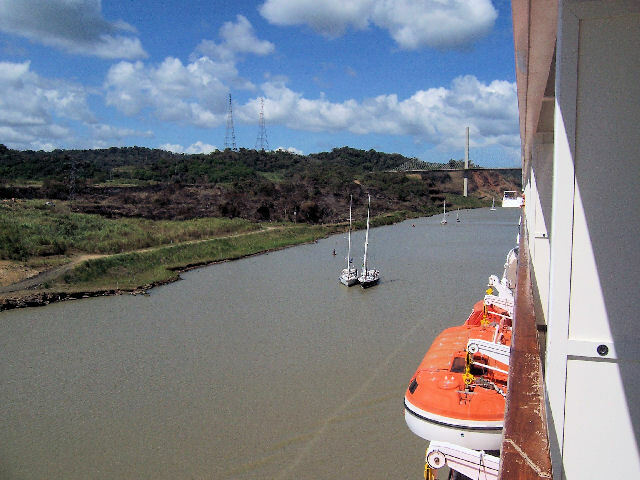 There are over 20 guests with over 100 cruises under their belt. Click for the French Dinner menu. This isn't one of our favorite menus, so we didn't expect a lot from it. The fruit appetizer was nicely presented in an orange basket, but the portion was tiny. We'd have had more food if the entire orange had been on the plate instead. The onion soup has never been one of Crystal's strong points, but it was improved tonight. The mixed greens salad was unusual and good. All of the produce has been very fresh and interesting so far, by the way. The lamb was extraordinary, couldn't be better. The "traditional" selection of the salmon and the steak were satisfactory. The fish was better than the steak that suffered from being a tad too tough, but it tasted good. The side dishes were very good, especially the green beans. We had two desserts tonight because of the birthday thing. Martin confirmed before they embarrassed us that we didn't mind if they did the singing. Ordinarily we hate that sort of thing, but here it seems so genuine that we don't mind it at all. There were balloons on the table also. The headwaiter rounds up anyone he can and comes over singing with the strings playing Happy Birthday. It's very nice actually. Even Herbert, the Hotel Director, joined in since he's seated just across the railing from us. He sent us a bottle of dessert wine, which was very thoughtful of him. We also ordered the Grand Marnier Soufflé since it is the only soufflé remaining on the regular menu since the reduction in desserts. We don't even have to say how good it was, do we? Oh, and cost accountants be aware that even the vanilla sauce for the soufflés is now measured out for each soufflé into tiny shot glasses rather than dispensed from a bowl. Yes Crystal, we notice that kind of thing. Remi talked at length about how hard the maitre d' tries to please everyone. We know that to be true, although we don't ask for much. He said, "Just let us do our job and it will all be worked out to make everyone happy." In other words, don't freak out. Just tell him nicely what you want and he'll figure something out. Scream and make demands, you can forget it. Amen to that. Oh, and don't bother with the bribery, that doesn't work here, besides the fact there is no need for it. If he can make it happen, he will because he genuinely wants you to have the best experience ever. The Evening Entertainment is the popular production show "Million Dollar Musicals". The birthday greetings continued in the Galaxy Lounge as Dio greeted Dave by name and wished him a happy birthday. On the subject of the show, it was fine. This is by far our favorite production show because it flows well from beginning to end. There aren't any glaring lulls and the costumes are beautiful. Even some of the staging borders on brilliance. All of the productions are suffering somewhat because they are missing one of the female dancers. This was particularly evident in tonight's show during the "My Fair Lady" sequence with the black and white gowns. They did the best they could with what they had, but it did affect it missing an elaborate costume. We still enjoyed it, as did most of the people we could see. 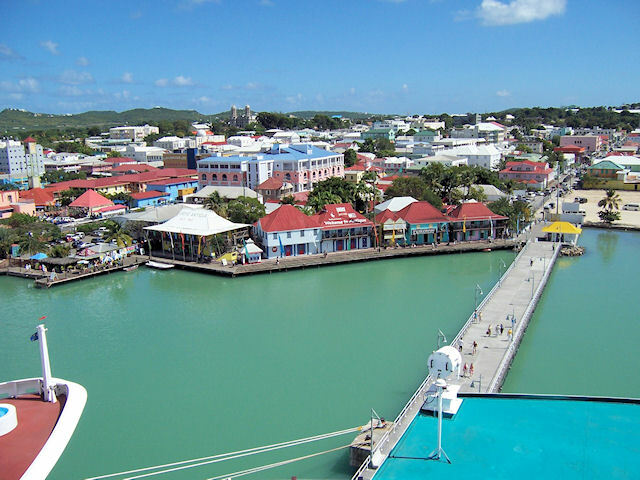 Antigua's sunny climate and easy-going Caribbean ways are alluring attractions for visitors. It boasts 365 superb white beaches and is home to a beautiful National Park that stretches for ten square miles. 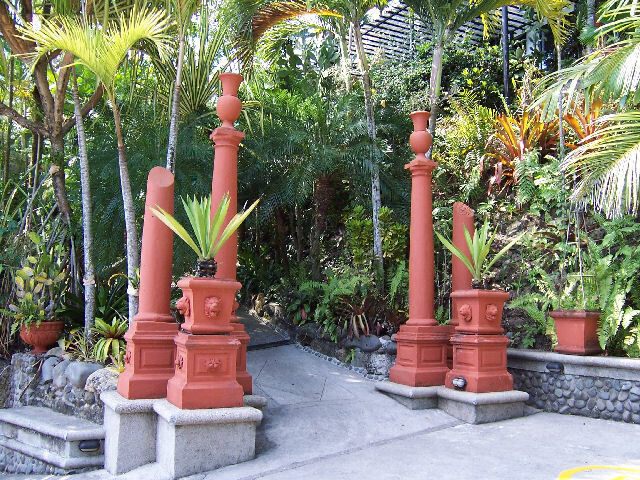 Found within this park are the famous English Harbor and Nelson's Dockyard. 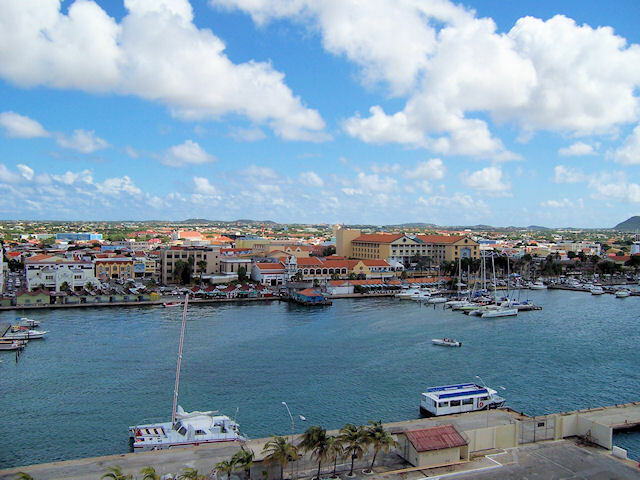 Horatio Nelson was posted here early in his career and the harbor was the headquarters for the British fleet during the 18th century. 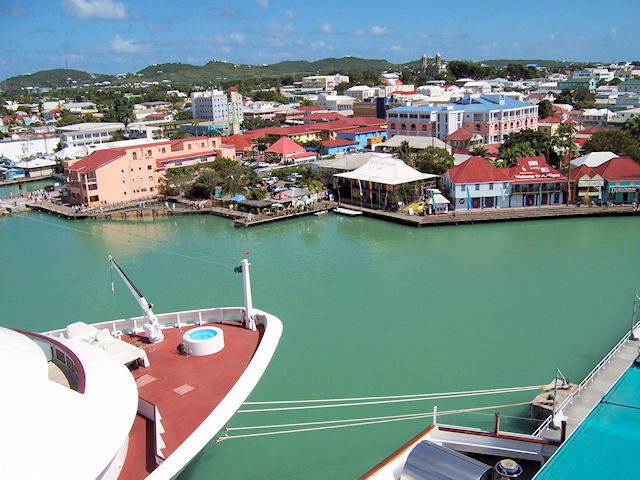 Although Antigua achieved its independence in 1981, it continues to bear the unmistakable imprint of centuries of British rule. There was no sleeping beyond 10:00am this morning due to a crew fire drill. We were awake anyway by then, so it didn't affect us. 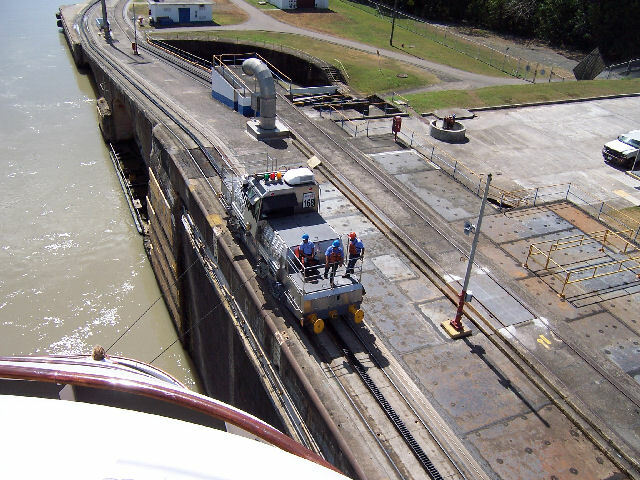 It was one of the extensive versions with the crew assembling at the lifeboats, elevators shut down, and various alarms and announcements in the staterooms. 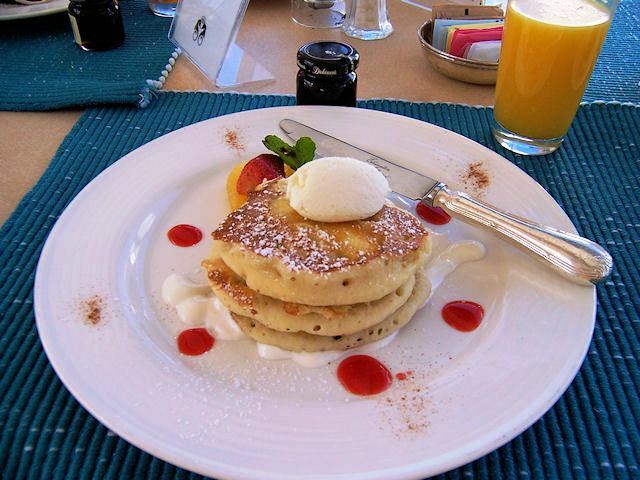 Our first stop was the Late Riser's Breakfast at the Trident Grill. 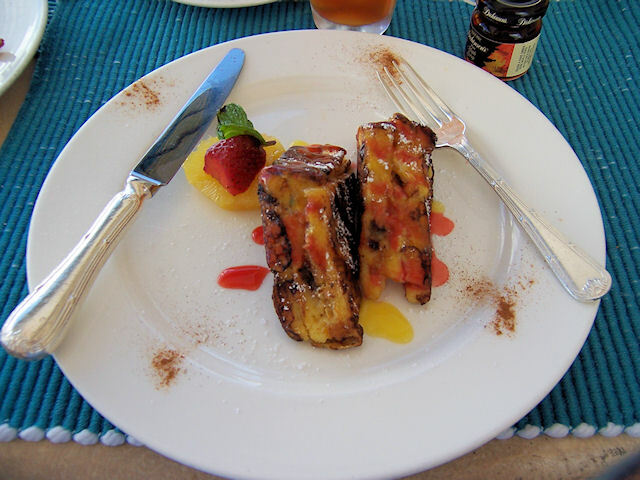 We again ordered the Apricot-Stuffed French Toast and the Lemon-Ricotta Pancakes. The portions weren't quite as tiny, but we took pictures for you anyway (click on the links above). The French Toast portion last time was half what you see in today's photo, no kidding. Deck stewards who hadn't seen Dave last night came over and continued the birthday greetings. We were served by about six of them today, so there is certainly no lack of deck service around here. After eating we did the usual Sun Deck loop and took some pictures of the surrounding area. They are presented in the order taken from port-aft to starboard-aft. There are three other ships in port, the AIDAvita, Carnival Liberty and another one that is hidden behind the huge Carnival ship. 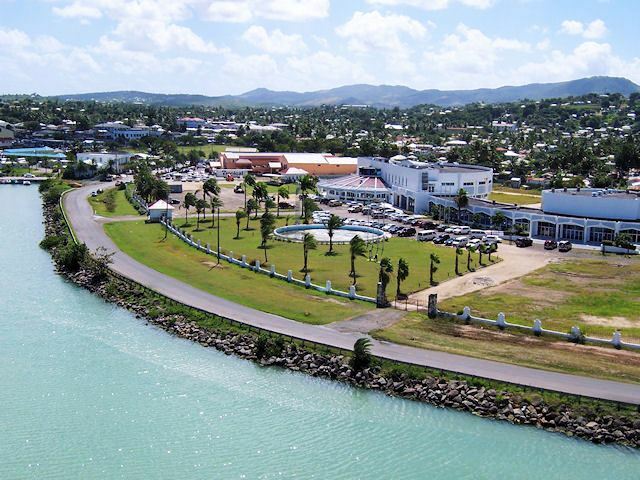 Photos: Fort Ruins, AIDAvita, Town Waterfront, Shops, Pier Area, Cathedral, Government Building, Waterfront, Harbor Entrance. A butler we ran into in the corridor told us it is very hot ashore and to be sure to wear a hat if we go out. After being out in the sun on the upper decks we decided to take Teodor's advice from yesterday and stay onboard. We can see the entire town from the ship, so we aren't missing anything. 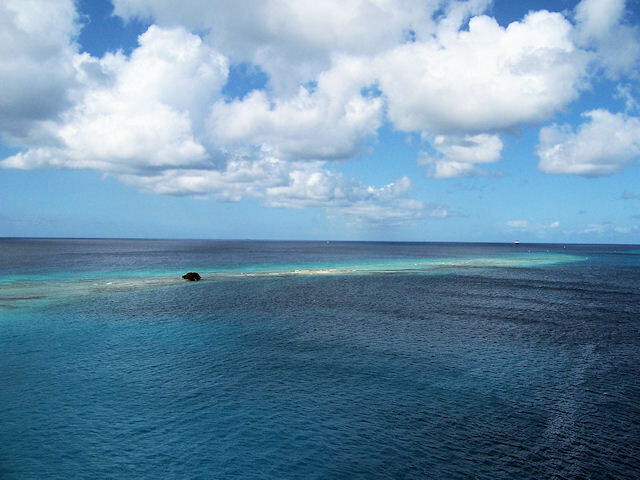 There is a strong breeze blowing that makes the heat bearable, but since we aren't interested in buying diamonds there's little reason to go ashore here unless on an excursion. Click for Luncheon Menu. We skipped the regular lunch time due to our late breakfast and spent the day mostly on our verandah. There wasn't much of a view except of the passengers wandering around on the AIDAvita across the pier, but sometimes that can be more entertaining than anything. 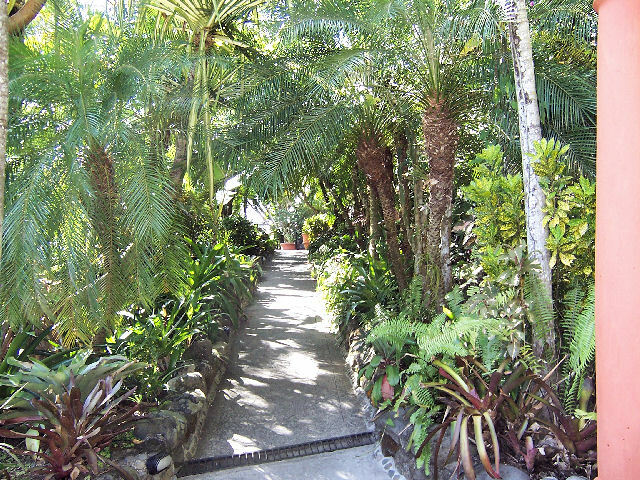 We went up to the Trident Grill in the late afternoon for hot dogs and burgers, then back to the verandah where the air was at least moving. We find it odd that they never open the sliding roof over the Neptune Pool even halfway. It certainly would have been more pleasant there if it had been open more today. As it was it was too hot and stuffy to stay for long. Teodor brought back the stained t-shirt that the laundry tried to fix again. This time it was fine, although you can still see the stain slightly. We'd still wear it, no big deal. This must happen fairly often because there was a pre-printed card attached to it saying that they didn't want to try it again after this or it might bleach out the color. Teodor also brought us chicken quesadillas as our canapés for tonight, so we ate those while we sat on the verandah to watch the sail away. By the way, the other ship that was in port that we couldn't see earlier was the Radiance of the Seas. Tonight's Dress Code is Casual. We were invited to the Captain's Quarters for cocktails tonight, so that's where we went. There were a couple of people there we knew besides the cruise staff. Once we were alone and standing to the side out of the crowd (we were actually just trying to stand under the air conditioning, not avoiding people), the Captain made a bee-line over to talk to us. He doesn't talk much to anyone, so we were privileged. He's quite pleasant when you get to know him. Well, he's pleasant all the time, but he's more talkative once you break the ice. He knows us from past cruises and also that we don't pester him or complain, so we're a safe bet at a cocktail party. We also chatted with Paula Jean and Jane, who says she owes us a birthday drink one of these days. Click for Dinner Menu. The dining room was quiet and relaxed tonight. There weren't all that many guests missing, but it made a huge difference in the noise level and chaos. We chatted with just about everyone we know in the dining room tonight, but not at length particularly. The food was quite good overall tonight and the portions were reasonable. The crab tower appetizer was good, not great, both salads were fresh and tasty, as well. The fish entree and the turkey were outstanding. The turkey is a particular improvement. It was nearly inedible for the past 10 years, but since last year it was been outstanding. It looks exactly the same and all of the side dishes are identical, except they are edible. The creamed peas were actually very good, which is a first in our lifetime. The stuffing was pretty awful, but we can live with that. We had pre-ordered chocolate chip soufflés for tonight, which were delivered by Martin. They were superb, as usual. Too bad the only soufflé remaining on the menu now is the Grand Marnier version on the French menu. We've seen a lot of changes over the years and unfortunately they are usually items that have disappeared rather than additions to the menus. Remember when the headwaiters used to cook main courses tableside? And desserts? The flambé desserts are still done in the dining room by the headwaiters, but not tableside. That's not something we're interested in particularly, we're just reporting what we know. Also, there used to be special orders all over the place every night. Now we see almost none and at the most one or two in the vicinity. In our opinion, this is a good thing because special orders occupy the headwaiter and waiters, thus diminishing the service at the waiter's other tables. Special orders are still available if you tell your headwaiter the night before, but they don't push it the way they used to. We're sure they'd be very happy if no one placed off-menu orders. You'll always get the "with pleasure" response when placing a special order, of course. The Evening Entertainment is singer-comedian Jimmy Travis. We did not attend the show. We picked up our passports for the immigration inspection in St. Thomas in a couple of days. Our call time is 9:30am, which is certainly better than the usual 6:00am in Los Angeles. We're told this will be the only U.S. immigration inspection, so our arrival in Miami should be very easy with no early wake up calls necessary. In Los Angeles when we have been in-transit we always have to get up at the crack of dawn just to parade through the terminal and back on board. Apparently none of that will be necessary in Miami. 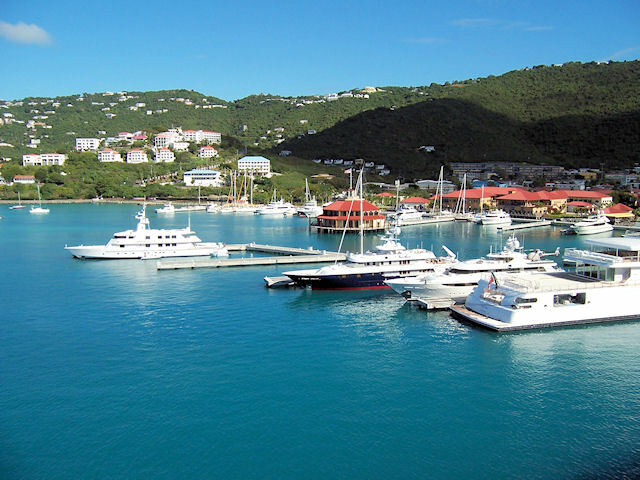 With its colorful mix of French charm and Dutch hospitality, St. Maarten is like two islands rolled into one. 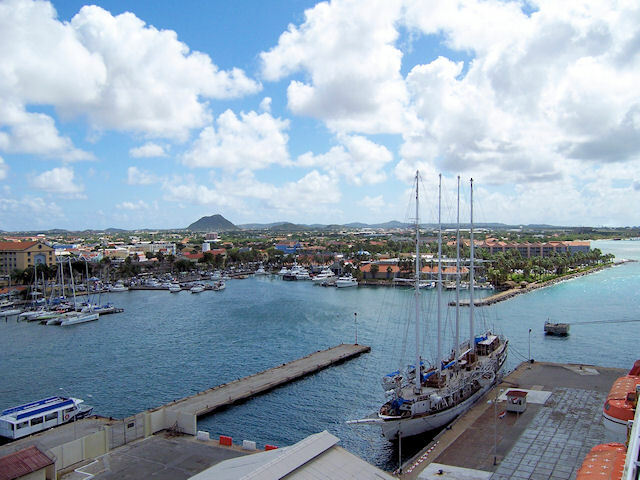 In 1648, it was amicably divided and the border between Dutch St. Maarten and French St. Martin, although completely open, exists even to this day. 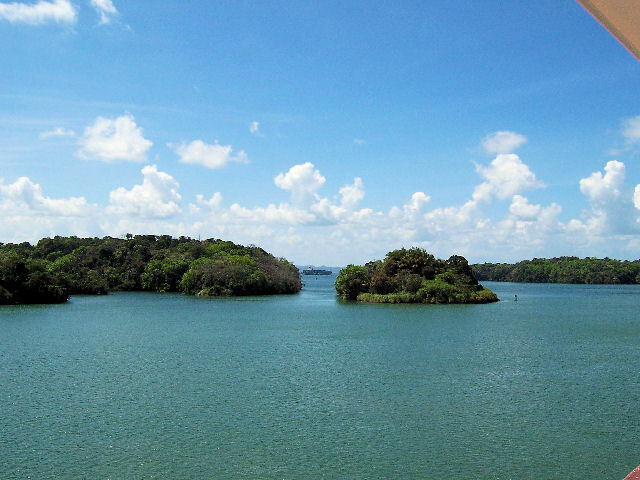 The island covers an area of 37 square miles, 17 of which are Dutch. 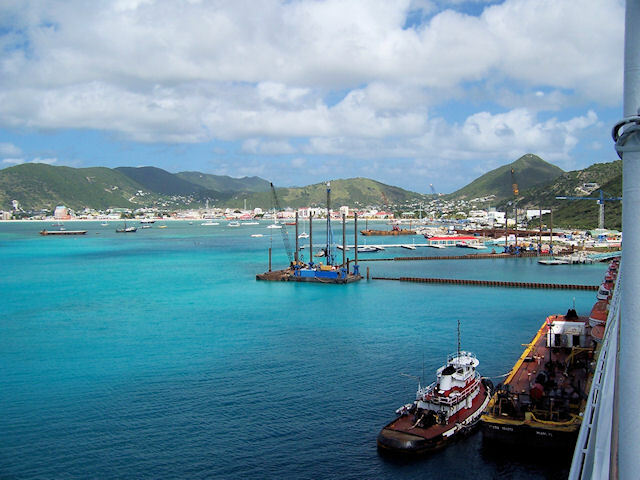 Small as it is, St. Maarten has something for everyone - hideaway beaches, interesting cuisine and sophisticated boutiques. Today's weather is nearly perfect for this part of the world. It is in the low 80's with a strong breeze and sunny skies. We've been here before, at least we think we have. The bay looks familiar with the sunken ships and such in the middle of it. 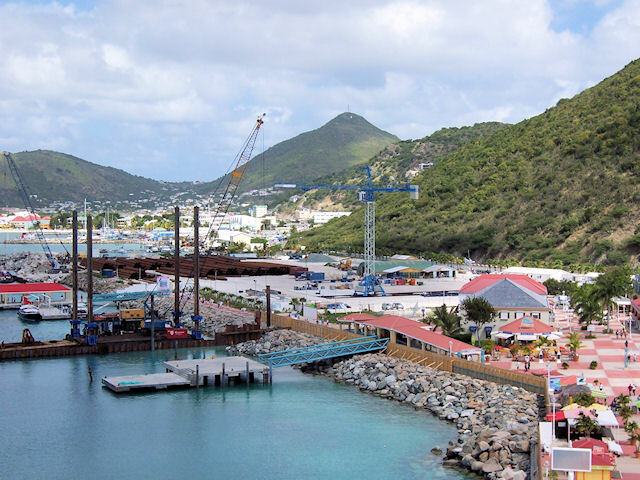 There is some construction adjacent to the ship that appears to be additional docking space or maybe a marina, but it is too early in the process to tell for sure. The town is a short distance away from the pier, within walking distance. 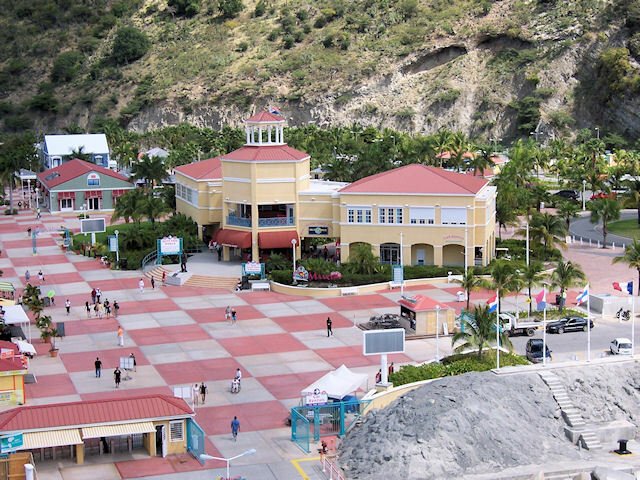 There are also some shops in the pier area, plus a car rental agency and tour office. We did not go ashore today. Our first stop was the upper deck to take the photos linked above, then it dawned on us that neither of us had remembered to bring our room key. So, back down we went to find a butler who let us into the room. He said we were lucky we didn't lock ourselves out on the verandah where we wouldn't be noticed for hours. Makes sense, but we're not quite sure how someone would do that unless the person inside locked the sliding door and left the room. Come to think of it, some couples on the world cruise might do that on purpose now and then. We had lunch in the Lido where it was very quiet at noon. One of the waiters told us they are expecting a rush in about 30 minutes when all of the tours return. Both lines were open, so there shouldn't be much of a wait, if any. It was windy sitting outside, but the temperature was very pleasant in the shade. We took some time to look at the dessert selection in the Lido today for the first time. At first it looks sparse, but what they have done is make tiny tasting portions of many different desserts. For example, they have crème brulee in small ramekins. This way you may try several different desserts and still not have as large a portion as you would have just getting one normal size item. There are also several choices of whole cakes and pies that are sliced for you, plus the usual hot dessert that is usually a flavor of bread pudding. The sugar free items are still available, as well, plus cheeses and fruit. Since there are only two different desserts served at dinner, at least we know they aren't bringing the leftovers to the Lido like they have in the past. We assume the desserts in the Bistro are the same as the Lido, but we haven't checked it yet. We keep forgetting to fill you in on the new internet system that is supposed to be faster. When it works, it does seem quite a bit faster than it was in the past. However, it stops and starts frequently and doesn't work at all from around midnight to 1:00am, or thereabouts. It also sometimes doesn't work well when the ship is in port. All in all, it is better than it was before, but you are better off highjacking a wireless signal from ashore if you can. 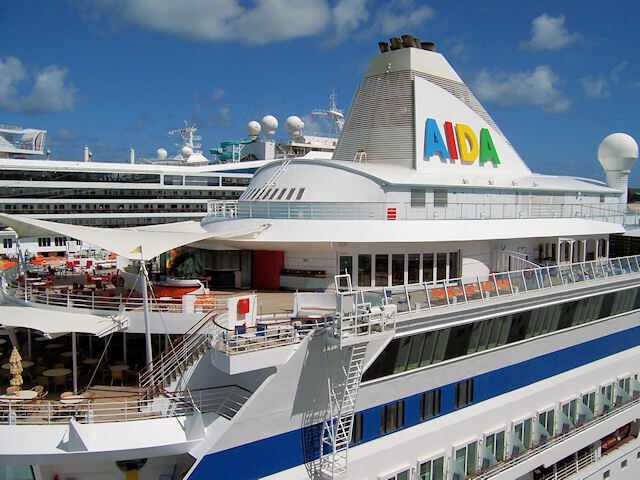 For example, Aruba had a public wifi connection that was $5.00 an hour or $10 for the whole day that was accessible from the ship. 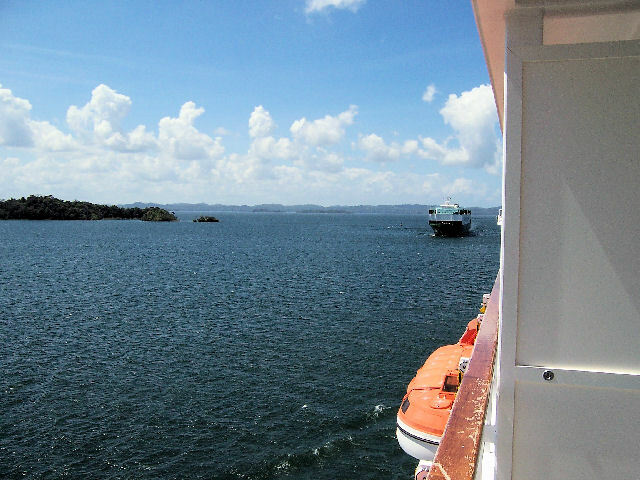 During our port time there, the ship's internet connection was extremely slow and virtually useless. Overall we'd say that the ship's internet system is reliable enough for the average user retrieving and sending a few emails, but beyond that it is very frustrating. After lunch we went back to the room and stayed on our verandah for most of the afternoon. There are two other ships in port with us today, the Radiance of the Seas that is directly across from our verandah, and the Westerdam that is at our bow. Crystal Symphony is dwarfed by those two huge vessels. Teodor brought us guacamole and chips for our canapés tonight as we sailed away. Both of the other ships left before we did today. Click for Dinner Menu. Dinner tonight was as it has been the past few evenings, fairly quiet in the dining room. As far as the food goes, it was very good. The corn bisque isn't as to-die-for as it used to be, but it is still good. The pasta course was nice and spicy. One of us had Dusko add a chicken breast to it for a main course, which turned out to be a good choice. The fish entree tasted good and looked nice, but the fish was way overcooked and tough. The portion was satisfactory though. The desserts were, well, strange, but a nice effort at being different. The best way to describe the trilogy of melon is "petite". Serving it in a huge pasta bowl made it look even smaller than it was, but it did look attractive. It was a refreshing alternative if you really didn't want a big heavy dessert. The "classic" apple crumble was OK, but it's hard to believe this is a popular choice. It was heavy on the crumble and very light on the apple. Besides, it was an apple crumble tart, not a true apple crumble. We wouldn't order it again. The Evening Entertainment is the prehistoric (well, not quite) production show, "Rock Around the Clock". The staff costumes and themed dining experience are no longer, but this show just won't die. Dave swore off this show about three cruises ago, vowing never to waste his time seeing it again. Bill on the other hand is a glutton for punishment and did go see it. If you've never seen this production before by all means go, it's better than some of the other older shows Crystal dredges up now and then. Actually, they didn't have to dredge very deep for this one because it has never gone away as far as we know. 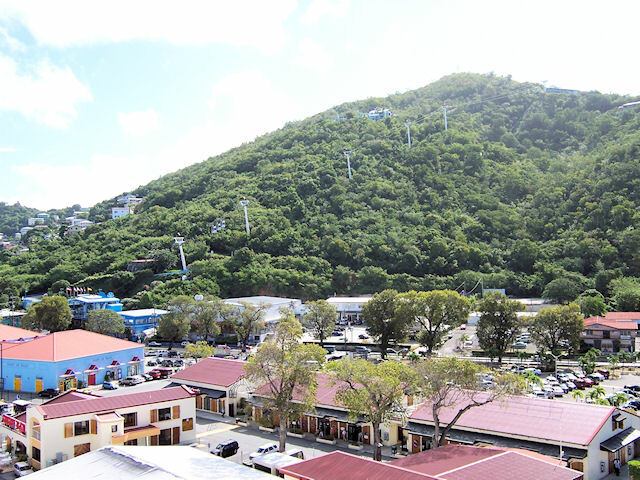 Glimmering bays, shining seas, powdery sand beaches, towering green hills and unsurpassed shopping - this is St. Thomas. 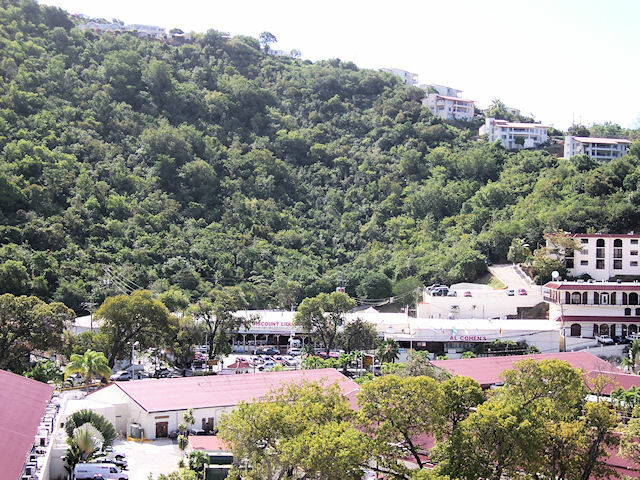 The Danes originally declared St. Thomas a free port, making it the shopping paradise it remains today. You will delight in exquisite imported goods ranging from Danish silver to French porcelain and Swiss watches. 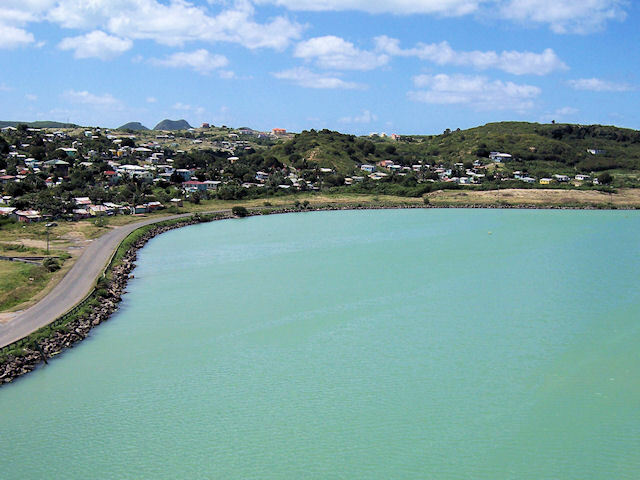 While this mountainous island is one of the loveliest stretches of land in the Caribbean, its offerings are not limited to its idyllic tropical scenery. 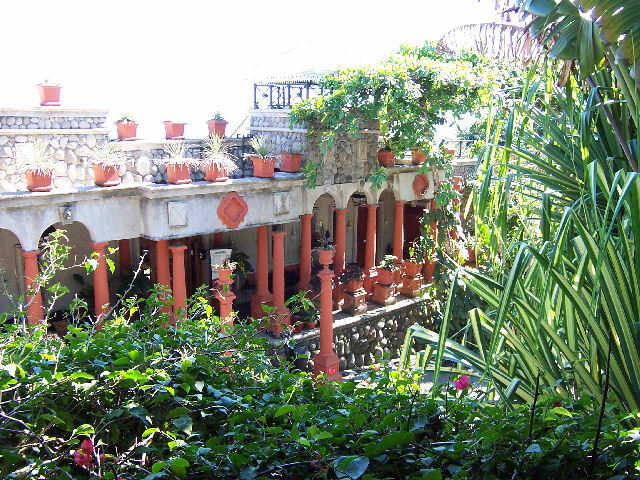 The former pirate haunts, Danish relics and picturesque old buildings are constant reminders of St. Thomas' exotic history, making this a fascinating place in which to sightsee. We had set an alarm for 9:00am in anticipation of our immigration inspection at 9:30am. Thank goodness we woke up at 7:00am because there were already announcements saying they are ahead of schedule. Groups 1-9 were called by 8:30am and our group 10, the last one, was called shortly thereafter. By the time we wandered down to the Galaxy Lounge there was no line and only two immigration officers standing there looking at passports. Let's just say that the officer checking passports was worth the price of admission, but it didn't help that he laughed at Dave's passport picture. At least he thought he looked better in person and not vice versa. On the way to the Lido for our first real breakfast this cruise, we ran into Andrew (former Crystal Society Host, Concierge, etc.) who says he was asked to come back for a few months to help out at the front desk. From what we have experienced so far, the only issue at the front desk is that the women there don't understand English well enough to be in the position. We've never had any problem in that regard in the past. They're very nice, but getting a straight answer to a simple question has been fairly hit and miss. Breakfast in the Lido was very good with a wide selection of just about anything one could think of and then some. There were no crowds today at all. Most of the tours left around 9:00am, so the majority of guests were already gone. The Lido food has been greatly improved in the past couple of years and breakfast is no exception. Hot foods are hot and fresh, and cold foods are cold. There is a nice variety of breads and pastries, although we think they could do a bit better in the pastry department. We were satisfied with what we had. While waiting at the omelet station a woman barged up with her own pan and wanted to cook something. Apparently that isn't a problem except she had an aluminum pan and the stove is induction. In case you don't know, an induction cooktop uses magnets to create heat in the pan itself, so if a magnet won't stick to a pan, it also won't heat. She never did understand the cook trying to explain to her why her aluminum pan wasn't getting hot. Luckily our eggs were ready long before we saw the outcome of that exchange. Today's weather is again nearly perfect. It is in the low 80's and not terribly humid, although it is wise to stay in the shade. Amazingly enough, Crystal Symphony is the only cruise ship in port today, something that is highly unusual. We've been here before when there were seven ships in port, which is a total nightmare in the town. Not that we plan to go ashore, but still. Unfortunately, it is fairly chaotic and noisy anyway. Constant sirens, float planes, etc., jar you awake should you nod off. It's not exactly the tranquil place portrayed in the glossy ads, but it is nicer than some of the islands we've been to. At least the hills are green and lush. St. Thomas is quite pretty actually. 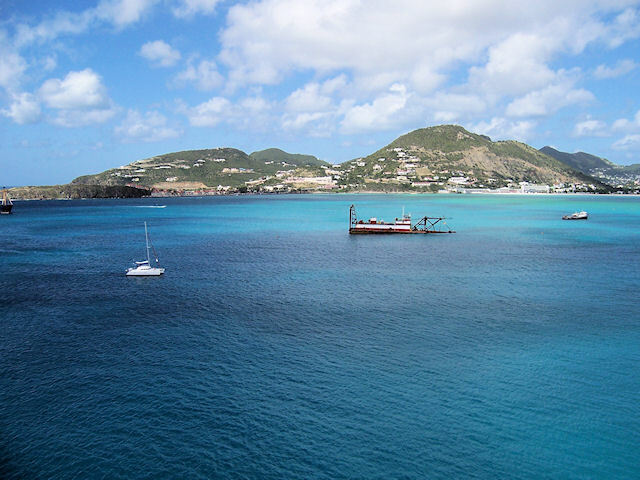 The bay is full of sailboats and the main part of town fronts the turquoise waters. 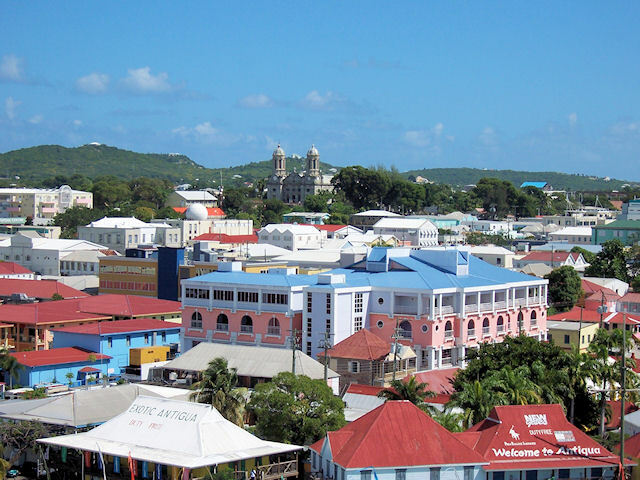 The town looks nice enough from a distance, but up close it is mostly a tangle of the usual duty free shops found in any Caribbean port. 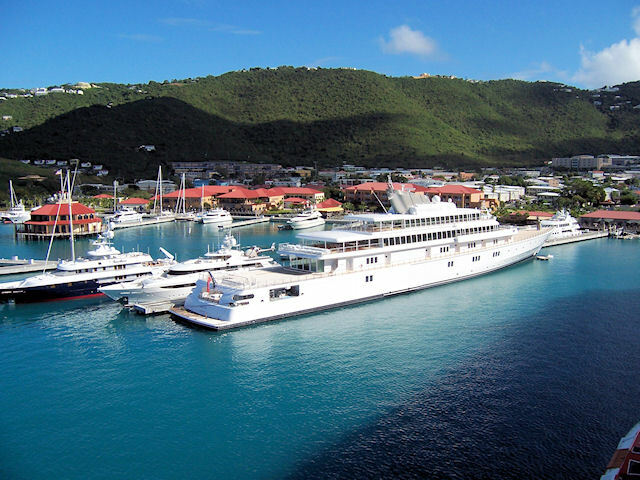 Adjacent to the cruise ship pier there is a small marina filled with yachts, plus one mega-yacht that is rumored to be captained by one of Crystal Symphony's former officers. Of course, there is a shopping mall directly attached to the pier. We've shopped there in the past and the stores are nice for what they are. 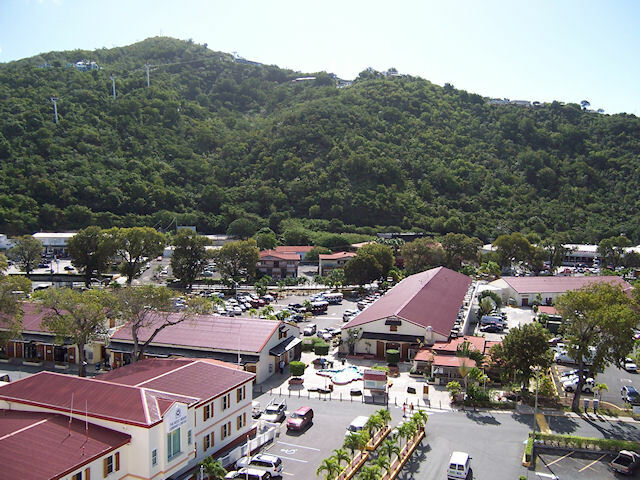 Across the street is a cable car that takes you up to an observation point overlooking the harbor. And then there is Al Cohen's Discount Liquor Emporium! We're sure that place must be jumping when other ships are in port. After the rounds of port photos, we retreated to our shady verandah for the afternoon. We've yet to figure out how we get sunburned every day when we are never in the direct sun, but apparently the Caribbean sun has the power to penetrate metal. Every night several people comment on our sunburns and expect us to say we've been lying on a beach all day. Yeah, like that's ever going to happen! In the hallway a woman was commenting on some flowers that were sitting outside of a room waiting for disposal. Basically she wanted to know why she didn't get any. She asked Teodor, who started to say something vague until the woman said, "I guess they are only for the suites," and so he just agreed with her. The real reason is that she hasn't been on enough cruises to get that sort of thing yet and/or her travel agent doesn't like her enough. Click for Luncheon Menu. We did not go to the dining room or the Lido today, so we can't vouch for any of the food. We can, however, comment on the service at the Trident Grill this cruise. It's totally dysfunctional. Sometimes you get what you order, sometimes not. Some days you get your order in a few minutes, other days it takes 20 minutes. It doesn't seem to matter if it is busy or not. There are two guys cooking, plus the cook who has been around for quite a while, but he's off doing something else and just pops in now and then. Besides the issues mentioned above, the area is also filthy with grease running down the front of the grills, stuff all over the counters, etc. It's very unusual or we wouldn't be commenting on it. We believe part of the problem is a language barrier, but that only accounts for the incorrect orders, not the bumbling around behind the counter. This afternoon while several guests were getting agitated because of the incorrect or missing orders (that doesn't include us, we really don't care), one of the guys was diligently cutting filo dough into strips. Um, isn't that something that should be done in the galley? Or at the very least, when it isn't busy and there aren't guests waiting? Anyway, we eventually got the two cheeseburgers we ordered, piled up a plate of fruit and started to head back to the room with it. We were intercepted by a deck steward who insisted on carrying the two trays down to the room for us. How nice was that? One thing you can always count on is great service from the deck guys. In the late afternoon we asked Teodor to bring us more than the usual amount of canapés because we can't re-order 300 times in Jade as we usually do tonight. We try to behave somewhat around other people whenever possible. So, he brought a chicken quesadilla, a tuna sandwich and an egg salad sandwich. That should tide us over and make it appear as though we aren't the pigs we truly are at the dinner party. 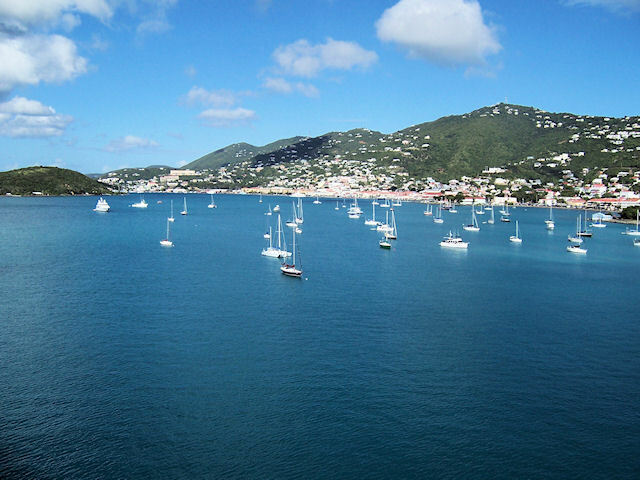 It was pleasant outside eating our snacks while sailing out of St. Thomas. 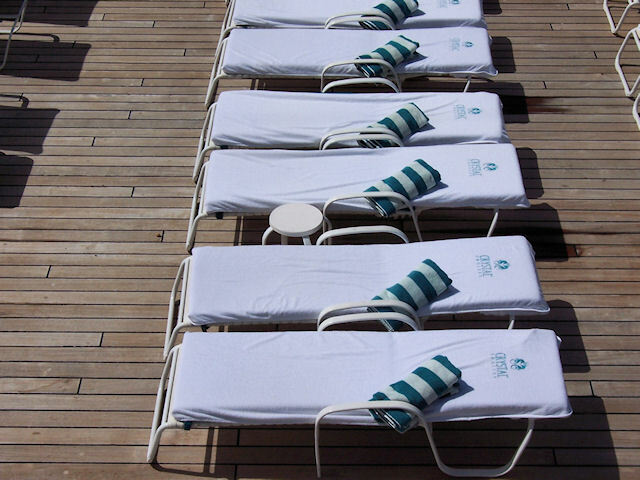 No other ships came in all day, so the guests of Crystal Symphony had the place to themselves. The Quality Assurance questionnaires arrived this afternoon. We're glad we aren't leaving in Miami! We haven't been here long enough yet. The Evening Entertainment is a concert by "Internationally-Acclaimed Russian-Born Piano Virtuoso" Liana Forest. Rule #1 - Do not schedule the shows for the Late Seating before dinner. If you do, we won't be there. Such is the case tonight. We wouldn't care if Mozart himself rose from the grave. If the show is scheduled before dinner, it doesn't exist. There was also a cabaret performance by Jimmy Travis in the Starlite Club at 10:15pm, so they did make an effort to have some sort of entertainment after dinner. However, wouldn't it make more sense to have the main show at the regular time? Or does Ms Forest have to get to bed early or something? Grrrr. By the way, we passed by the Starlite Club after dinner at the end of the show and it was standing room only. Take a hint Crystal, shows belong after dinner, not before. Click for Dinner Menu. Tonight is our Crystal Society Dinner in Jade Garden, so we did not go to the Crystal Dining Room tonight. Don't even ask about the food tonight in Jade because we don't have a clue. When we're with other guests we just don't notice the food all that much. Jane put together a nice group, well, one other man besides us and herself. Wise choice since he feels the same way we do about these dinners as it turns out. Therefore, everyone was happy! We had a lovely conversation about a variety of subjects, none of which we're going to tell our readers about, so there. Don't worry you're not missing anything earth shattering, but we do know how to be discreet, believe it or not. After dinner we were asked to join our dinner companion for drinks, so we went down to the Crystal Cove. It was quiet after the crazy group with the children left after a few minutes. Since when is it appropriate for children to be sitting in a cocktail lounge? Don't answer that. However, they left and we three continued our conversation about how we all hate answering the inevitable questions about what the heck we're doing here, are you brothers, etc. At least now we know we aren't the only ones who find that stuff tedious. Apparently there are more that we thought hiding in the shadows and not participating in the group thing. Not to mention the ones who avoid the world cruise like the plague. Boy, can we understand that. So, after being vindicated, we called it a night and went to bed. We're still smoothly sailing along toward Miami. It is hot, humid and mostly overcast. The sun does poke out now and then, but most of the time it is cloudy. Our first stop was the Lido for lunch, which was fine, as usual. By the way, the section of the buffet that used to have a boring selection of sliced meats now has an interesting array of fairly fancy appetizers such as dried beef wrapped cheese sticks, tiny fajita salad cups, crab salads, etc. The sliced meats are still there, but now there is something interesting to choose from in this area. It is different every day. The Prego waiters working the buffet today were on the surly side, which is odd. It must be the end of their contract coming up in Miami. They seemed very distracted and not the least bit interested in doing their job. Everyone else was friendly and attentive as usual. We overheard a conversation regarding the problems with the children on board. They are part of one extended family residing in several Penthouses. We're sure the family must have spent a fortune on this cruise, but that doesn't excuse their behavior. We aren't anywhere near them and haven't been affected by them at all, but that can't be said for their direct neighbors. The woman we heard said they have been running up and down the halls screaming until well after midnight, taking mail from the clips and switching it to other rooms, etc. She said she has had to call down to the desk several times because when she opened the door to look the nanny was just standing there doing nothing to stop them. Someone from the ship's staff has talked to the parents several times, to no avail. We didn't hear all of the details, but apparently the ship has reached the limit of what can be done on board. Anything further would have to come from the L.A. office. This is what happens when Crystal starts advertising to get families and children on their ships. If this kind of thing continues it will drive away their most loyal guests even faster than the large groups have done already. Crystal is walking a dangerous tightrope with this type of advertising targeting passengers inappropriate for a luxury product. After lunch we wandered out to check out the pool scene, but found all of the tables in the shade occupied, as expected. So it was back to the air conditioned comfort of the room for us. Shore Excursion order forms for the next cruise were delivered today with an invitation to book before the next guests arrive. In transit guests also get an advance opportunity to book the alternative restaurants. The rest of the afternoon was spent catching up on DVDs we brought from home. Teodor brought a plate of cold cuts, crudités, dip and toast for our canapés tonight. Tonight's Dress Code is Formal for the Captain's Gala Farewell. There was a Captain's Farewell Cocktail Party in the Starlite Club before dinner that we did not attend. Click for Dinner Menu. We booked a reservation in Jade Garden for tonight, so we didn't go to the Crystal Dining Room. Our dinner in Jade Garden was pleasant as usual. Larry told us that the chef had a special suggestion of a Thai dinner for us tonight. It consisted of Thai versions of shrimp, lobster, and chicken, all of which were very good and a nice change from the regular menu. We also had the crispy beef we always like. The service in Jade is always very friendly and attentive, so it's an enjoyable evening. Most of the other diners were staff members which is common on formal nights when most guests prefer the Crystal Dining Room. We chatted for a few minutes with Andrew who we ran across in the Starlite Club on the way to the show. We still think he's the best Crystal Society Host/ess ever, not that any of the others aren't good, but he was very organized and seemed to have the job down pat. Poor guy has gone back to help at the front desk for a couple of months, so he has none of the privileges that come with the higher positions...no dining in alternative restaurants and he has to share a cabin, for example. He said we must have felt like we went through a time warp when we saw him at the front desk last night. That pretty much sums it up. The Evening Entertainment is the production show "Curtain Call". The vast majority of guests seem to love this show, but we find it trite and somewhat boring. Some of the choreography is quite good, but the musical selections are very dated. If we never hear another rendition of "The Impossible Dream" or "Memory" we'll be very happy. The audience does tend to get sucked in with the finale number from "Mama Mia", but we judge the show on its whole, not a rousing finale alone. There are some very well done numbers in the show, but overall we just can't get into it. It could easily be updated to make it more palatable, but we doubt that will happen. We move back one hour on the clock tonight. The weather this morning is about as perfect as it can get. It's not too hot, not too humid, and the sea is smooth. 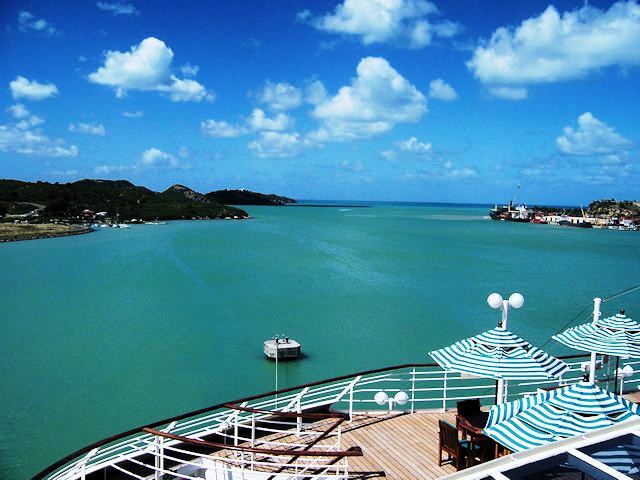 Too bad we're not in a port because it is so nice we might actually leave the ship. Well, maybe not. We were up earlier than lunchtime, but still didn't bother leaving the room until then. There is a American Classic theme buffet around the Neptune Pool for lunch, but it isn't one we'd go to even if the ship wasn't as full as it is. Click for Luncheon Menu. We had to wander for a bit to kill 30 minutes before lunch, but we found Paula Jean with no guests waiting for her, so we chatted for a few minutes. We were sort of there on official business, looking for some maybe-cruises round trip from L.A. before next year. No luck with that though. 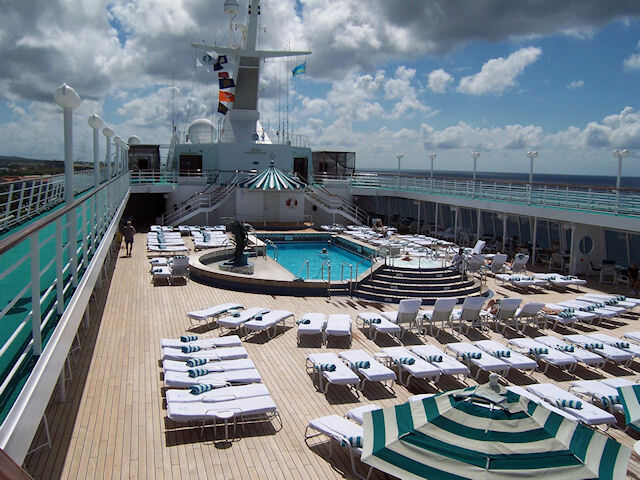 The 7-day cruises aren't worth the effort to leave the house, so we'll just keep what we've already booked and save the 50th for the next round. It wouldn't be wise to end up with the 50th Milestone on the L.A.-Hong Kong crossing anyway because that one is already a Value Collection cruise. It makes more sense to use the free cruise on something that isn't already discounted. Lunch in the dining room was quiet with only the tables for two along the windows occupied, plus a couple of larger tables. Our lunch selections were all very good. The jambalaya was especially tasty and the pineapple carpaccio was an interesting take on pineapple and cottage cheese. The Sandwich of the Day was very good, but the bread was impossible to bite through without everything squishing out of it. Dusko wisely brought us steak knives to cut it up. The meat was tasty and tender, but the bread was very chewy. The rosemary flavored fries were an interesting variation. The entire presentation was quite attractive for a luncheon. We both had the Ice Cream Sundae "Peach Melba" for dessert, which was very nice. The only issue with that was that the spoons are too large to fit in the bottom of the glass it was served in, so you can't get the last few bites. It did look good though. Our Captain's Quarter photo was finally on the board to purchase, so we took care of that on the way back to the room. We also wandered through the shops for the first time this cruise, finding absolutely nothing of interest. The new shops are very attractive, but the merchandise is way overpriced and fairly skimpy in our opinion. There were a few more Crystal logo items than the last time, but not nearly as much as there used to be. We certainly can live without a $160.00 polo shirt, no matter what the fancy brand may be. The 50% off Caribbean t-shirt table was popular, but we didn't even look at it except to note its existence. On our mail clip were envelopes containing our new keycards for the next segment, plus U.S. Customs information for Miami. 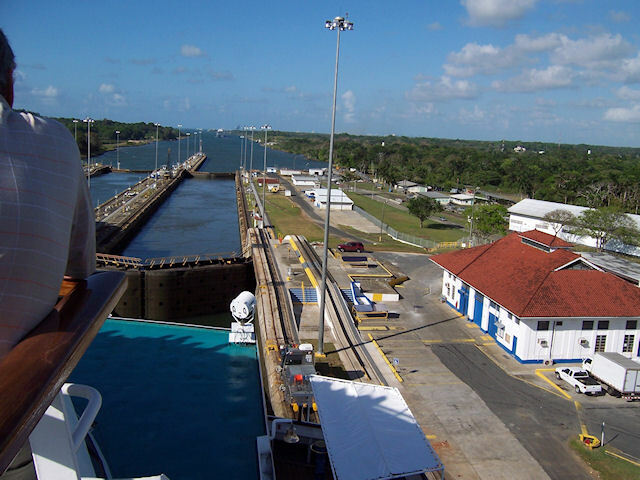 As in-transit guests we have to meet at 10:15am to be escorted through customs ashore. When the ship has been cleared we can re-board. We've done that several times in Los Angeles and have only had to wait a few minutes to get back on board. The whole process is pointless for us since we have bought absolutely nothing so far. We stayed in the room for the rest of the afternoon, avoiding the luggage piled in the corridors and the screaming children who were running amuck today. Teodor brought a plate of fruit for our snack today, which was plenty since we were still full from this afternoon. We've reached the full from top to bottom point, but we'll recover from that soon enough. Tonight's Dress Code is Casual. We were on the way down to dinner with a few minutes to spare until we stopped to chat with Teodor in the hallway. Then another butler came up and accused him of locking us out in the corridor the other day (we both forgot our keycard) and how he saved us by opening our door. You had to be there, it was funny the way he said it. Click for Dinner Menu. We were fifteen minutes late for dinner, but we weren't the last ones to arrive. Dusko only had us to serve tonight, so he didn't mind. The waiters never seem to mind if you are late, within reason. As far as food goes, some of the selections were average, and other were great. The soups were satisfactory, but they weren't as good as they have been in the past. The pasta course was very nice. We always choose the Sweet and Sour Pork on the last night and it was exceptionally tasty tonight. Dusko brought another serving, but the original portion was fine unless you are really hungry, which we were. The main course portions haven't been ridiculously tiny for the past few days. They're not huge, but are big enough when you add several other courses. The Prima Ballerina dessert was attractively presented and sufficiently light and airy to be a nice finale to a full meal. The Evening Entertainment is a "Farewell Magic Showtime" with illusionists George & Holly Sateriale. On the final evening the shows are always scheduled before dinner on the assumption that most people are packing after dinner. They are usually sparsely attended anyway. We can understand the logic in this, but whether we make it to these early shows is rather hit and miss. We did not attend tonight's show. There was a bit of movement as we sailed along tonight. Not rough by our standards, but it's just about the first time it is obvious we are on a ship. It has the largest city population in Florida, is the third most visited American city among international travelers and showcases an Art Deco Historic District encompassing one of the largest neighborhoods entered on the U.S. National Register of Historic Places. Miami certainly boasts its share of impressive characteristics, even before adding to the list its gorgeous beaches, spirited Cuban population and ritzy enclaves of Coral Gables and Coconut Grove. We have no idea why we bother setting alarms on the last day of a cruise because we always wake up way earlier than necessary. But, of course, if we didn't set it we'd probably sleep until noon and have to be tossed overboard in our underwear. Today's weather is very nice. It was 66 when we got up around 8:00am, but warmed up quickly to the high 70's by 11:00am. Our first stop was the Lido for breakfast, which was the same as always, very good. Disembarkation didn't begin until 9:10am, but the last call was made by 10:15am, so Crystal definitely has it down to a science. Nobody does it better and with less hassle for the guests. On the way back to the room we passed the rooms formerly occupied by the screaming children. Exasperated stewardesses and butlers were scurrying around trying to pick up the pieces. They had to bring in the heavy duty cleaning crew to get the sticky spots out of the carpets and off the walls. Basically the rooms were trashed, although it didn't appear anything was irreparably damaged. Still, it was no fun and they were obviously scrambling to get them back in shape for the embarking guests. This next cruise every room is occupied, so there's no way to move anyone. We had to meet in the Hollywood Theater at 10:15am to be escorted ashore for customs inspection. On the way down we didn't see any disembarking guests at all because they were stashed in the Starlite Club. There was only one other guest in the theater when we arrived, but a few others came in later. Just after 10:00am a Shorex guy came in and said we were free to go ashore, so everyone wandered off the ship. Once out of the control of the ship all hell breaks loose. The woman at the end of the gangway was pointing us in the wrong direction until someone pointed out that we are in-transit. She didn't know what that meant, so they explained that we aren't disembarking and just tell us where Customs is. She pointed vaguely to the right, so everyone wandered off that way, down the stairs to another group of ground agents. These ladies kept asking all of us what color luggage tags we have. No luggage, no tags, where is Customs? Oh, over that way, sort of. Everyone wandered in the direction of the flow of guests with luggage. We handed the cards to the guard who asked why none of us has any luggage. Um, because we're IN TRANSIT. Ugh. Then we were disgorged outside to fend for ourselves. Several guests and entertainers stood around wondering what to do. Dave finally went over to ask the women in Crystal ground crew uniforms. "What does in transit mean? ", was the response. Not very promising, is it? After explaining that it means we are going back on the ship, she pointed vaguely to the left and we all wandered off in that direction. First open door with a guard? Nope, keep going sort of to the left, maybe. Finally we found the front of the terminal, which was about 20 feet beyond the door where the guard told us to keep walking. That door was obviously closed, so we all moved off to the side to wait until the ship had been cleared. Luckily the weather is very pleasant today, so standing outside wasn't a big deal. This cruise was as expected. We never left the ship, didn't buy anything, and didn't do anything. What else is new. The weather was perfect throughout. We encountered no problems during the cruise, although others were complaining about the out of control group of children. We only saw them a few times and they didn't bother us, but they were fairly rude. They'd run right into you in the hallway and not say a word. Heads up Crystal, we hear that several of the guests in neighboring penthouses, including the Crystal Penthouse, will be demanding their money back. We learned that this same group also had their own rabbi to oversee the kosher kitchen to prepare their kosher meals (who knew there were orthodox Jewish people in Panama?). Since they wanted to use the "good china" rather than packaged things, they had to purchase the new silverware and china from the ship. Wouldn't it be easier to stay home? We're told that all of this was WAY more effort than Crystal expected, so it may not be available in the future even if you are willing to pay for it. The food remains outstanding for the most part. We'd like the main course portions to be larger, but that seemed to work itself out once our waiter realized we wanted more food. The new dessert menu is too skimpy in our opinion. If the two desserts that change every night were better we might not care, but most of them only looked good, but weren't worth the calories otherwise. It's a nice try, but it needs some more work. We haven't mentioned this before, but if you are aware of Crystal's claim that casual dining is available for dinner on "most" evenings you may be interested. During this 11-day cruise with many sea days, there was only one casual dining evening and it was on a casual dress code night anyway. Why even bother? Either do it every night except maybe formal nights, or give it up. It certainly isn't something to count on. For the next cruise, there are only two casual dining evenings and that is a 14-day cruise with only five port days. By far the best a Crystal Cruise has to offer is the crew, the crew, the crew. They absolutely couldn't be better. They're friendly without being cloying and genuinely care that you are having a good time. One way to gauge sincerely is the last day of any cruise. Here, even on disembarkation day at breakfast they are wishing everyone a safe trip home, asking when you are coming back, etc. 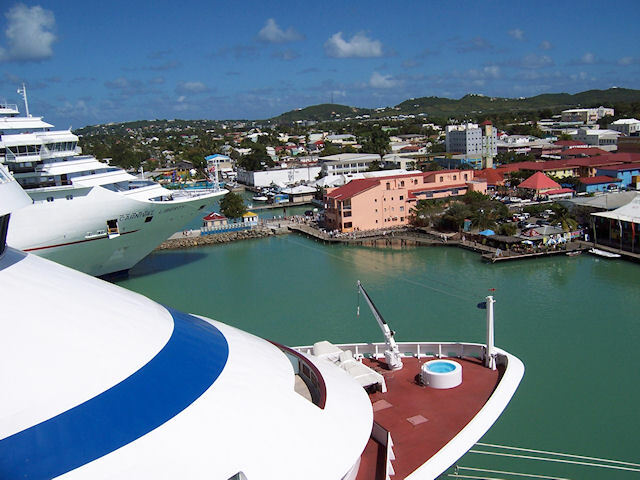 On most cruise lines as soon as the tips are dispensed the crew could care less about you. Not so here. 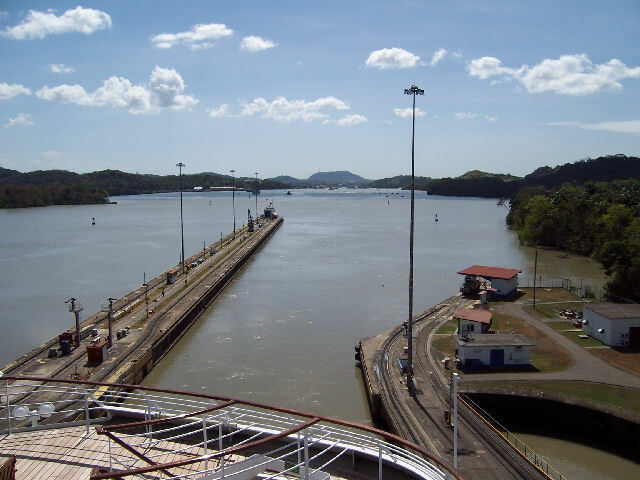 Now, on to the return trip to Los Angeles, which begins on the Grand Panama page.